This page is designed to help you through any issues you may be having with your fishes' health. I hope, however, that you have found this page simply to learn more about Koi health and not because you are in the middle of a fish emergency. If you have wandered here outside of an emergency situation, I would highly recommend you read through this page now. This will go a long way in you being prepared for any fish health issues that may arise, and possibly help you to prevent them. More importantly, it will help you to quickly notice any minor symptoms that your fish may exhibit and why. ALL fish will ALWAYS exhibit some sort of symptoms early on in any pond or health problem. Sometimes these symptoms are very subtle and not recognized as symptoms to the untrained eye. The key is to learn to recognize these symptoms well before the situation becomes dire and well before it may be too late. If you keep fish for any length of time, you WILL have problems with their health at some point most likely. This is especially true with Koi primarily because they can live for 40-60 years! Because they are so long lived this increases the odds that you will see problems over that time span. There are also times that fish get physical injuries. Things like predators and even the breeding behavior of the fish can cause these injuries. 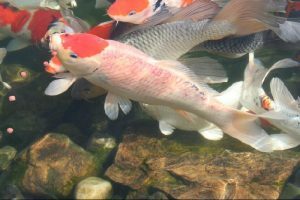 This section is designed to help you recognize and diagnose even the most subtle symptoms that your Koi may be exhibiting. As stated, all fish will exhibit some sort of symptom well before it is close to death. Many of these symptoms will apply to Goldfish and other species as well. We have broken these symptoms into two categories. One category is physical symptoms and the other category is symptoms by body language or behavior. These are symptoms that are visible problems you may see somewhere on the fish: things like sores, lumps, bumps, fuzz, cuts, rashes, missing scales etc. The list goes on and on. Some are more discrete than others, but all require that you periodically inspect your fish. It would be best if each fish could be captured and examined closely, but many folks find this to be difficult. If this is the case, it is still very possible to inspect and notice these issues from pond-side. During feeding is a good time to make these inspections. Simply pick an individual fish and follow it for a period of time taking note of anything that may look suspicious. I would recommend doing this monthly at minimum. Quite often fish with any type of issue will exhibit some sort of abnormal body language or behavior. They may swim differently than normal, they may sit on the bottom without moving much, jump out of the water, stop eating, hang around the waterfall or moving water, or isolate themselves from others. These are just a few of the body language/behavioral symptoms fish can exhibit. Diagnosing symptoms of any kind requires a bit of detective work. This is especially true, however, in the case of reading body language/behavioral symptoms. As stated above, this is where one or more fish exhibit some sort of abnormal behavior. No one knows your fish and how they normally act better than you. So you have the best chance of recognizing behavior that is abnormal for them. You have to know what to look for in some cases, and this section will guide you through that process. Water Quality, Water Quality, Water Quality! Right now I can tell you with confidence that no matter what the underlying cause is found out to be, in many cases it started with some sort of water quality issue. Any problems that occur in the pond water quality can and will lead to symptoms, sickness, and even death. The only question is what period of time it takes from the start of the problem to symptoms appearing or fish falling ill. So before we go any further you NEED to understand proper water quality. No matter your situation, be it an emergency with sick and/or dying fish to you just seeing some odd behavior, you need to stop right here and go to the article "The Science of Water". You will need to learn the material there and immediately begin testing the water and correcting any issues you may find as the result of testing. So as you can see, no matter the problem, emergency or not, the first thing you must do is test and correct any water quality issues. Many times you may find that this alone will halt any symptoms and/or stop any further symptoms or deaths. You cannot begin to treat any fish unless the water is perfect. Otherwise you will be drastically reducing your chances of success. However you must also understand that if you have had water quality issues that went undetected for some period of time, the damage may be done and too serious to correct by the time you do figure it out. This is why it is critical to be testing your water on a regular basis. Below I will give you a few examples of how things get much more complicated to diagnose and/or fix if you have not been regularly testing your water. In this example let's say you have had an ammonia spike of 1ppm ammonia that you did not catch. This spike lasted for a few days. In this example a few days of ammonia at this level in the system can really do some damage depending on other variables like pH and water temperatures during the spike. This at minimum hurts the fish's gills and severely stresses their immune systems. At a given point you will notice fish acting weak, and or dying....i.e. ; seriously noticeable symptoms! So you test the water and you find the ammonia and correct the issue. So all is well? Maybe not! You must understand that you may still have some residual losses caused by the initial damage of the gills and immune system, and you still may lose a few more or even all of the fish. In this example you simply caught the problem too late to save them. This is where many people make the mistake of not understanding this fact and then they panic. They go to some so called fish store and they sell them all sorts of treatments and magic potions to cure their ailing fish! However, by not understanding that the initial water quality issue caused these residual losses they throw all these potions in the pond in hopes of getting lucky. Instead all they really end up doing is killing the remaining fish more quickly. The key here is not to panic if you do see residual losses. Understand that once you have fixed the water you have done all there is to do in this situation where poor water quality alone was the culprit. Now again we have the same example of a 1ppm ammonia spike. This time, however, after you correct the water quality problem, all the fish or remaining fish survive. A few days after correcting the water they start to perk up some and act better. At this point you may think all is well and pat yourself on the back for a job well done! Now two to three weeks passes after the initial problem. Once again you start to see fish acting weak. So you immediately check the water, but this time you are fairly sure it is ok because you learned a lesson and are now testing it on a regular basis. Sure enough, you test and there are no problems, but some of the fish are looking very badly! So what is going on now? In this case, the initial problem you had with the ammonia weakened the fish to the point that their immune systems got severely compromised. In their weakened state, the parasites, and /or bacterial pathogens that live on the fish and in your water saw an opportunity to attack the fish! This time frame from initial water quality issues to an attack by pathogens many times is from 2 to 3 weeks. So in this example you fixed the water, the fish improved for a short time, but two to three weeks later they become ill due to parasites. Now you have a more serious situation and one that is a little more difficult to fix. You have now learned one way that a water quality issue can also lead to a pathogen/parasite attack and disease a few weeks after the initial water quality issue. Do you see the snowball effect poor water quality can cause? We discuss these in detail in other sections. So for now just know that when Koi exhibit some sort of symptom it is most likely one of the above culprits. You must also understand that sometimes only one fish is showing symptoms and sometimes it is many or all of them. This in itself is a clue! Before you begin your diagnosis there are some very important clues you can use to shorten the process. Basically, if most or all of the fish are exhibiting symptoms, and/or these symptoms appeared in a short time (a day or two) then there is a very good chance it is a water quality issue. (The only other thing that could cause a large percentage of fish to show symptoms quickly would be a virus.) This is especially true with behavioral symptoms. Most often water quality issues happen quickly themselves and therefore it affects the fish quickly. So this is a very important clue, and if this is the case you will quickly get the proof when you test the water. If only one or a small percentage of fish show symptoms, and these symptoms appeared over a period of weeks, (one fish at a time), and the water tests ok then the culprit is more likely to be pathogens like bacteria or parasites, especially the latter. Normally these parasites attack one fish and start to multiply. As they multiply they spread from fish to fish in the system. This usually takes a little time to happen. So the first thing you need to do is figure out what percentage of fish are affected and symptomatic. Then as stated previously, and no matter your suspicions...TEST THE WATER! In diagnosing any fish problem a microscope can be invaluable. If you rule out water quality as the possible cause of your problem, the next step would be to scope the fish for bugs. We discuss the use of a microscope and the identification of parasites in another section. Many folks are falsely intimidated about using a scope and therefore don't get one. If this is the case it makes diagnosis much more difficult. 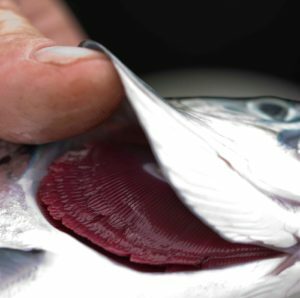 As well you are forced to treat all the fish by a "shotgun" /"cocktail" method of treatments to cover all the possible bugs that could be affecting your fish. In summary when you have a problem the first thing you do is test the water for ammonia, nitrite (with an "i") pH and kH using PROPER test kits. If you don't know what these are then you need to first read the article 'The Science of Water" before proceeding any further. The second thing you do is to take note of what percentage of fish are exhibiting symptoms. One, a few, or all of them? Below we have listed quite a few of both categories of symptoms. As well, we have included photos and/or accompanying videos that you can use to learn about these symptoms and what they are, or use them to compare to some abnormal behavior or issue you may be seeing in your fish. From there you will be led to a treatment page. Flashing is one of the most common symptoms/behaviors seen in Koi and goldfish and is easily noticed. It is not always a symptom of impending doom, and sometimes it is more a simple reaction to a simple stimulus. It should make you take notice and keep a closer eye on things until you can figure out what is causing it. However, flashing can also be the first symptom to appear at the beginning stages of a deadly scenario or one that may become deadly in time. So diagnosing the cause quickly could save your fish! This is especially true when you see every single fish in a given population exhibiting this symptom. This is a case where you want to take this symptom a little more seriously. The same holds true if a large percentage are exhibiting jumping as well. As you see in the video above, every one of the fish are flashing and only one or two are jumping. We will discuss jumping below. However, with this many fish flashing I would start my investigating ASAP. Personally, if I see just one or two fish flash it is almost meaningless to me due to all the minor reasons that may cause it, many of which are not health risks at all. Even if I see most of the fish flash I don't panic and can usually discover what the cause is very quickly if I don't know off the top of my head already. For instance, if I just did a major water change in that system, I almost expect to see them flash. We will discuss this and other reasons one by one and in detail. No matter, I never get all that concerned, but I will watch them more closely for more serious symptoms to appear. With many years of experience with literally millions of fish, there just are not too many things that are going to surprise me. I have learned to discriminate the finer points of flashing and usually can instantly say if it's water quality, parasites or whatever. I then take the appropriate steps to fix the issue if need be. You also have to understand that in this commercial operation and we are testing the water on a daily basis! So we are in better touch than the hobbyist may be just for this reason alone. So look at the list of possible causes that best matches what you are seeing, and check them off one at a time until proving to your satisfaction that you have found the cause. I have tried to put these possible causes of flashing in order from the most common to the least common. Many times this can be one of the easiest scenarios to diagnose, believe it or not. This is because many times when all or most of the fish are flashing, and this started quickly over a day or two, the problem is usually a water quality issue. You still should look for patterns with patterns in this case as well. Test the water for ammonia, nitrite, pH and kH. Even low levels of ammonia can cause flashing. As a matter of fact, it's the lower levels that do so more often than not. Higher levels of ammonia can show other symptoms, such as red fins, clamped fins, fin twitching, and excess slime coat on the body as well Also hanging in the water, or gasping at the surface. These symptoms will be listed and discussed elsewhere in this section. If you detect any ammonia in the water, there is a good chance that this is the culprit, and you should read on. It is vital you eliminate or neutralize it immediately! The flashing should be gone within 4 -24 hours if the culprit was ammonia alone. If no ammonia was present then check the nitrite (with an "i" not nitrate with an "a"). If nitrite is present you must add salt to the system. For every 1 ppm nitrite you need to add enough salt to achieve a .02% solution. (point zero two percent). This salt addition must be done correctly however. You can get more details about this in Koi/Pond Emg/Koi Treatments section. If nitrite was the culprit, the flashing should cease within 24 hours. If your kH gets too low, this will cause your pH to fluctuate diurnally. (in the process of a day) The fluctuating pH is what causes flashing. If this is the case, the fish primarily flash more towards late afternoon or evening when the pH swings to a point that it irritates the fish. So check both of these parameters and correct the kH as needed. If the kH was too low (below 100ppm or 5 drops) once you correct it the flashing should cease within 24-48 hours. Only increase the kH 20 ppm per day until you get to the desired 150 ppm or so. Never let the kH go below 100 ppm in the future. Occasionally, once you begin correcting the kH the flashing will continue until a day after you add the last dose of baking soda. In other words, the addition of the baking soda can at times cause flashing. So if this is the case you will see the flashing stop within 24 hours after the last dose of baking soda. You should note this fact for future kH maintenance. So don't panic if the fish flash some after a baking soda addition. This can be normal. 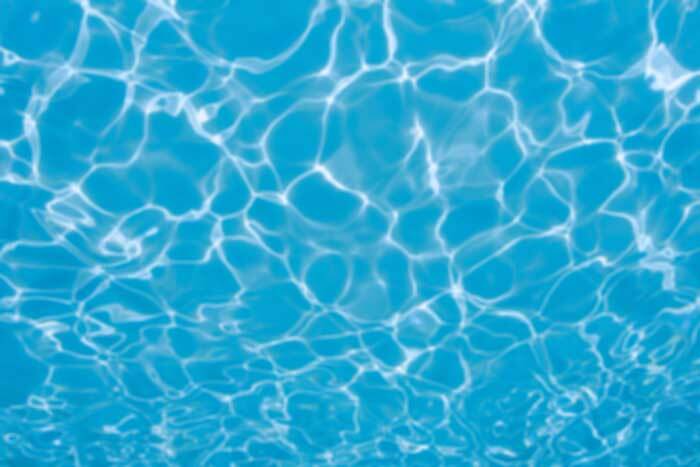 If the flashing continues and you have ruled out the normal water quality issues, read on. Have you added anything to the pond like water conditioners, algae treatments, multiple doses of baking soda, salt, or anything? If so, and the flashing began shortly after the addition of the additive, then there is a good chance that this is what caused the flashing. I cannot advise you beyond this point if this is the case. There are too many variables, and too many possible things you may have added. Just give them a day or so, assuming no other symptoms besides flashing appear, and see if the flashing subsides. I will say this, however, that there is nothing you should be adding to the pond except ammonia binder for ammonia spikes, dechlorinator to neutralize chlorine of any water additions, salt if you have nitrite or illness, and baking soda to maintain the kH. Also, if you have added any type of disease or parasite treatments, know these many times do cause flashing. Besides these items there is NOTHING ELSE YOU SHOULD BE ADDING TO YOUR POND! NOTHING! So don't waste your money on the many "snake oils" sold in this hobby. Firstly know that a PROPERLY done water change or addition should not cause any symptoms including flashing. However, many folks do not do them properly. This is discussed in detail in another section. How the water change affects the fish totally depends on how different the chemical properties are between the pond water and the new water. Things like temperature, pH, heavy metals, chlorine, and even ammonia can be present even in the new water! You should periodically test your source water right before any major water change and see if there are any major differences in these parameters. So if you have added any amount of water to the pond with the past 8 hours of the symptoms appearing, then this is most likely the cause for the flashing. The flashing should cease within 24 hours or so assuming you corrected any parameters that needed addressing. This is another common cause of flashing in outside ponds. Most rain is very acidic and can be a pH of 6. This is very low and definitely irritating to Koi and goldfish. So if you have had a heavy to moderate rain in the past 8 hours or so, this could be the cause. Sometimes the rain can dilute and lower your kH and this will indirectly affect the fish and cause flashing. Test the kH and pH and make sure they are good. Have you had any lawn care or other similar chemicals applied near the pond? These can eventually leach into the water and affect the fish or kill them. This is especially true if there has been a recent rain to wash these chemicals from where they were applied and wash into the pond water. Also any type of algae treatment can cause this. The brand Algae Fix is famous for this! I do not recommend you ever use this product. It is VERY dangerous to your fish. Many fish have been killed by this product! Again let me go back to the statement that you should not be adding anything to your pond but the things mentioned previously. Many folks have electrical devices in their ponds -things like submersible pumps, lights, fountains etc. Occasionally these leak stray electrical voltage into the water without tripping the GFI breaker. This stray voltage irritates the fish and causes flashing. However, many times the fish will only flash when they get close to the defective electrical device -not always but many times. This is easily checked with an electrical tester/meter. Simply stick one of the leads of the meter in the ground next to the pond and then the other into the pond water. If you read any voltage on the meter there is a problem with some electrical device in the pond. These are the most common culprits when most or all of the fish are flashing and started almost simultaneously. There are others for sure, but in most cases you will find the culprit in the above list. Just remember that if it is all or most of the fish flashing and it started quickly then most likely there is SOMETHING bad happening in your pond or system. You just need to figure out what it is along the same lines of thought as above. Flashing alone is not a serious symptom/issue UNLESS it happens to be only the first symptom of more serious symptoms to come. So watch the fish closely for more serious symptoms as listed in other sections of Symptom Diagnosis. Do not be in a hurry to jump in and treat the system with more serious and dangerous treatments. This will just confuse the issue as these treatments themselves can cause flashing! Give it some time before you decide a more serious treatment is warranted. I would say as long as no other symptoms appear, and you are not having any deaths, wait at least a week or two before doing any other treatments. Even then the first treatment I would do is salt the pond to .3% (point three percent) but done in .1% (point one percent) daily increments. Give the fish at least a week in the .3% and see if the symptoms stop. When you only see a small percentage of your fish flashing this could be a clue that it is parasites beginning to infest the population. However, as with any and all symptoms the first thing you do is test all the water parameters. These include ammonia, nitrite, pH and kH. While normally if there is a water quality issue it will affect most of the fish, it does not always affect them at the exact same time. Just like with people, individual fish can have varied responses to water quality issues. Some fish are simply more sensitive than others and therefore may show symptoms before certain other fish. If the water parameters check out ok, then investigate some of the possibilities listed below. Depending on the type of food you use, sometimes fish will flash after feeding. Some foods have lots of residue associated with them, and this residue gets into the water column and/or the fishes' gills during feeding. This can irritate their gills and cause flashing. If you feed a sinking food, as the fish pick it off the bottom, any debris, algae or muck on the bottom can get into the gills as well and cause irritation. So if you notice that the fish flash only right after feeding, then this is the most likely culprit, and the flashing should cease in a few hours at most. Koi can get sunburn or be irritated by the sun. This is especially true of non metallic white or mostly white fish. These fish are similar to people with red hair and fair skin. They are extremely sensitive to sunlight, and their skin is easily irritated by the sun. 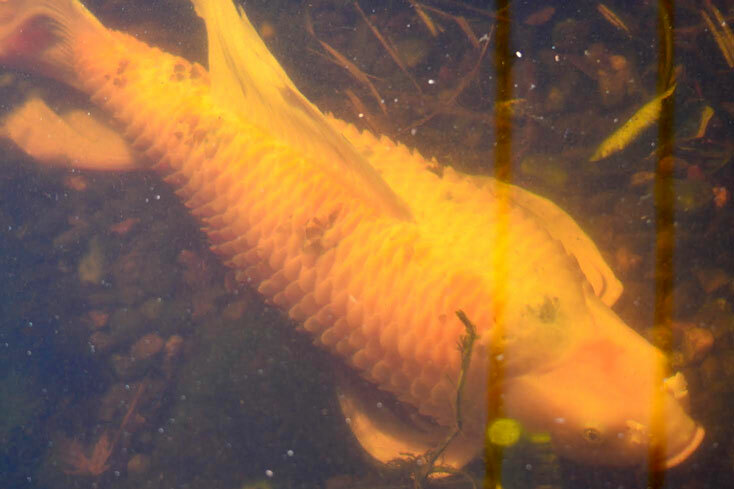 In Koi this is not a common issue, and I have written a detailed article on the subject in another article on this website entitled Koi/Pond Emergency. If sunburn is the culprit you may see a red rash appear on these white or partially white fish and primarily on their backs. To remedy this or to test if it is the possible culprit, simply shade the pond from the sun. It will need to stay shaded for at least two weeks. This is how long it takes minimally for the irritation or rash to subside. If none of the above seem to apply then there is a good chance you are looking at a parasite problem. This is where having a microscope would prove this beyond a doubt. In this case I would start with the safest treatment of salt to .3% (point three percent) but done in .1% (point one percent) daily increments. Give the fish at least a week in the .3% and see if the symptoms stop. Otherwise you will be forced to do a "shotgun" treatment with more serious/dangerous medications to address this issue. 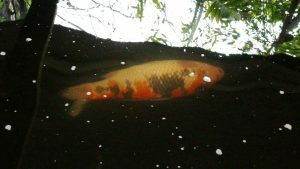 You can read more on this and other treatments in another section of this website entitled Koi/Pond Emergency. When only one or two fish flash this as well can be a sign of parasites. I would venture to say that this is the case about 50% of the time. However, as discussed elsewhere, there are many other variables that can cause these couple of fish to flash so we want to rules those out first. Again, the first thing you ALWAYS DO is test the water for ammonia, nitrite, pH and kH. As previously mentioned above, some fish can be more sensitive than others to certain conditions and/or water parameters. I will explain this in detail below. It applies to all the categories of flashing so make sure you read it! Depending on the type of food you use, sometimes fish will flash after feeding. Some foods have lots of residue associated with them and this residue gets into the water column and/or the fishes gills during feeding This can irritate their gills and cause flashing. If you feed a sinking food, as the fish pick it off the bottom, any debris, algae or muck on the bottom can get into the gills as well and cause irritation. So if you notice that the fish flash only right after feeding, than this is the most likely culprit, and the flashing should cease in a few hours at most. I go into great details on parasites and their treatments in other sections of this site. However, what I am about to discuss is a critical note and little known fact about parasites and their relationship with fish. Parasites can be a possibility in any scenario of flashing listed above. The only thing that varies are the odds of it being parasites from scenario to scenario. The odds change depending on the percentage of fish flashing in a given population. ALL fish have parasites to some degree. As a matter of fact, many parasites rely on using fish as hosts in at least part of the life cycle of the given parasite. This small resident population of bugs on the fish is normal and acceptable. It is only if and when the bugs get out of hand and completely infest the fish that it can cause more serious symptoms, illness or death. In short, this means fish always have bugs on them, and many times a few different kinds of bugs. Quite often these bugs have preferred places they like to hang out on the fishes' bodies. For example, gill flukes like to hang out in the gills. Hence the name gill flukes! Skin flukes like to hang out on the body of the fish. Other bugs aren't as picky and hang out in a place that is the safest or the tastiest, as some bugs actually feed on the fish. Occasionally a given bug will relocate to a new location on a given fish, and sometimes move to another fish! When this happens it irritates the fish as these bugs crawl or swim or whatever to relocate. Think of it like a tick or flea that gets on you. When you feel it crawling it itches. Well the fish have similar sensitivities. When this occurs it can cause fish to flash. The little known fact about these transient bugs is that they relocate based on water temperature as well, especially in areas especially that have temperate climates/four seasons. A gill fluke, for example, prefers to hang out in the gills, but they readily hang on the body of the fish as well. So this is just a generalization. However, if a given gill fluke is making its home in the gills during summer, it will move to the body of the fish or some other locale that is more conducive to protecting from the cold. Hanging in the gills during winter can be mighty uncomfortable due to the constant rush of cold water running over the gills as the fish breathes. Therefore, the flukes pack their bags and move to a safer location on the fish, one that protects it more readily from the cold rush of water. The opposite can happen with other seasonal or water temperature changes as well. This movement of the bugs relocating can be irritating to the fish and therefore cause flashing. You must also understand that most parasites become more active in warm water and less active in cold. So in the cold water the bugs simply do not move around much at all. As the water starts to warm, however, the fish and the bugs' metabolisms become more active. When this happens the bugs start moving around more on the fish simply to feed. So as you can see, when the water temps start to change from the seasonal temps changing, there will be movement of these bugs. This is why it is quite common to see flashing during these times and for a period of time until the bugs settle back down. So expect it as winter temps changes to spring temps and also as Fall changes to Winter. This migration of the small resident population of bugs is perfectly normal, and things should settle down in a week or so. If flashing continues for longer than a week, then and only then should you consider that the bugs are getting out of hand and require treatment. Again let me suggest to start with salt to .3% as discussed above before using more serious treatments. Many times the salt is all that is needed, but after salting the system to .3% give that a week or so to do its job. If it doesn't, then and only then move to more serious treatments. As a symptom, jumping is pretty much identical to flashing as for the reasons fish do it. As a matter of fact, most times jumping and flashing coincide with each other. You can clearly see this in the example video under Flashing above. They are both simply signs that something is irritating the fish, and they are trying to get rid of that irritant. Let's say you feel a bug crawling on your arm. What do many people do when this occurs? They freak out and shake their arm wildly to eject that creepy crawler from their arm! Fish are doing the same thing by flashing and jumping. When it comes to these symptoms, the only thing that varies is my interpretation of the symptoms. After many years of experience I have learned to take jumping more seriously than flashing. The larger the percentage of fish that are jumping the more serious I become, and thus the faster I will investigate why. So basically, the more fish you see exhibiting jumping the faster you will want to find out what the cause may be. To give you an example, let's say we have a pond that has .25ppm ammonia. This will many times cause some or all of the fish to flash given the right set of other variables like pH and temperature. A small percentage may exhibit jumping as well. This is quite common. When you see your Koi jump into the air, they are not playing or trying to catch bugs in most cases. As a matter of fact, I'm not even sure that Koi play in any manner, and as far as jumping after bugs, it is rare to ever see a Koi or goldfish do this. Some other species of fish do however jump out of the water to catch bugs, such as the Golden Orfe. In most cases, fish jump for all of the same possible reasons as listed above under flashing. So please refer to the step-by-step procedures listed under the "Flashing" symptom to help you diagnose the cause. In addition to the above symptoms, newly purchased Koi will sometimes jump. This could be a fright response, and they are trying to get back to where they came from. It may also simply be a matter of them trying to adjust to the new water. If it were the latter, then the jumping should stop within a few hours. When jumping, they do not realize that upon clearing the sides of the tank or pond, they will be landing on the ground. So be prepared for new arrivals to jump, and for this reason it is vital to at least partially cover the tank or pond for the first twenty-four hours or so after their arrival. If the new arrivals are quarantined as they are supposed to be, then they will more than likely be in some sort of tank. In this situation, I would highly recommend covering the tank completely with some sort of netting such as is offered in the "Predator Control" section of this site. Make sure to secure the netting as well because they can and will push right through it if it is not secured. It is also amazing what a jumping Koi can bust through, so use strong materials to cover them! If you are putting them directly into your pond and netting is not practical, then simply float something on the surface such as Styrofoam. This will make them feel secure and give them a place to hide, and this will discourage jumping. You don't need to cover the entire surface of the pond, however, just enough that they can sit under and feel more secure. If you did cover the entire surface with Styrofoam, and the fish did jump, they may land on top of the foam and get stuck there out of water. If they do not cease in jumping within 24 hours, there could be an additional problem with parasites or water quality, and you will also need to refer to the other possible causes listed under ”Flashing" above. This symptom can be caused by parasites, bacteria, fright, or poor water quality and in this order of most likely to least likely cause. As with any symptom, the first thing to do is ....wait for it......TEST THE WATER for ammonia, nitrite, pH and kH. If only one fish is showing this behavior, as is the case many times, then it is more likely to be a parasite or bacterial problem. Flukes would be top on the list of parasites. Without the use of a microscope to positively identify the culprit, you are forced to guess the cause. If the water tests OK in all parameters then we are down to the remaining possible causes of parasites, bacterial infection or fright response. The fright response is the next easiest to rule out. New fish to the pond can exhibit this behavior. They are frightened of their new surroundings, and they sit on the bottom motionless in an attempt not to be noticed. Give them a day or two and they will become less skittish most likely. If this proves not to be the culprit then we are left with the possibility of parasites or bacterial infection. I would also use salt to .3% in this situation as well, leave for one week to see if symptoms subside. If the symptoms don't subside after a week, I would move to a more serious set of treatments listed in the treatment section of this website. If multiple fish in a given population exhibit this behavior, and it came on suddenly, then the most common problem is usually water quality. If this is the case you will discover it when you test the water. If the water test is good then you are probably looking at a parasitic, viral or bacterial issue. The first thing I would try is salting the pond to .3% (point three percent) but done in .1% (point one percent) daily increments. Give the fish at least a week in the .3% and see if the symptoms stop. If the symptoms don't subside after a week, I would move to a more serious set of treatments listed in the treatment section of this website. This is a sign of some sort of severe stress. Quite often these fish appear dead, but as you go to net them they swim off. It can be due to water quality, disease, parasites, but most commonly hypothermia. It can also be due to a combination of all those stressors. When the water is cold (usually below 35 DF) certain individual fish can exhibit this symptom. Many times in this case it is simply that this particular fish cannot tolerate the cold well. However, it can also mean that they are additionally affected by a parasitic infestation and/or poor water quality. If multiple fish are exhibiting this symptom you can almost bet there are parasites and/or poor water quality involved. However, EXTREME cold water can cause this as well in many fish of a given population,especially if the extreme cold came quickly. In the case of this happening due to cold water, the best bet is to get the fish to warmer conditions. However, if you do not have a proper place and setup to do this, you will be doing more harm than good. This means you would need a properly sized tank that is covered to prevent the fish from jumping out. Most importantly, you would need this tank to have a cycled filter running 24/7. Without a cycled filter you will struggle keeping proper water quality and will surely drive the fish over the edge and kill them. Some folks take their fish in every winter to avoid the stress of the cold. Know, however, that most Koi can easily withstand the cold as long as there are no other stressors like poor water quality or pathogens. This is why it is critical to clean the pond before winter sets in. It is also critical to make sure the fish are not going into winter under the stress of a parasitic infestation. Look for the subtle symptoms of this occurring in the Fall. A helpful way to prevent hypothermia is to construct a temporary greenhouse over the pond. This will go a long way in keeping the pond from freezing as well as keeping fish from getting hypothermia. You can get more details on this winter covering in the Koi Emergency Section of this site under the sub menu of Wintertime Health Risks. This symptom is most recognized in the pectoral fins (front fins just behind gills) and the dorsal fin (top fin on their back). The fish will clamp their fins so tightly against their bodies it appears that the fins are not even there. Many times this symptom goes hand in hand with two other symptoms listed elsewhere. They are isolation and sitting on bottom. Most often it is only one or two fish that exhibit this behavior and not the entire population. If the entire population shows this then you have very serious problems and most likely multiple problems of the most likely culprits listed. Again, this can be a sign of poor water quality, bacterial infection, parasites, or physical injury. 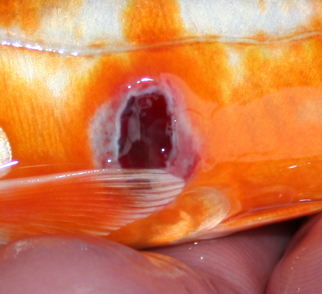 Try to capture any fish showing this symptom and inspect them for any physical injury. If you find none then the issue is most likely to be bacterial and/or parasitic. Check all water parameters: ammonia, nitrite, pH, kH and in addition check the nitrAte with the occurrence of this particular symptom. The ammonia and nitrite should be ZERO, and the nitrate should be below 50 ppm, but as high as 150 should be ok as not causing this symptom. 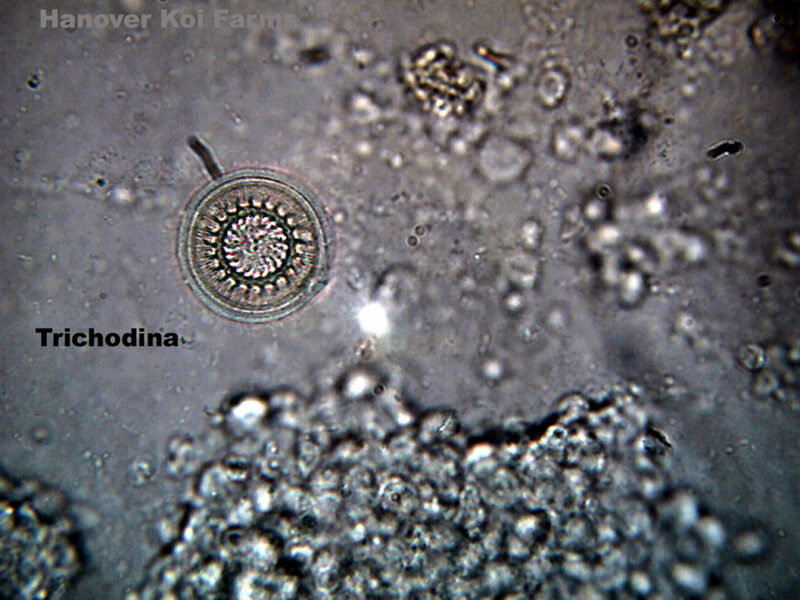 If all water parameters are good, then it is most likely to be parasites and/or bacterial. In this situation I would start with the salt to .3% (point three percent) but done in .1% (point one percent) daily increments. Give the fish at least a week in the .3% and see if the symptoms stop. If the symptoms don't subside after a week, I would move to a more serious set of treatments listed in the Treatment section of this site. 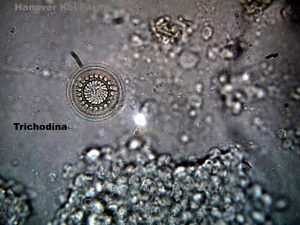 If the symptoms don't improve after the salt for a week, I would treat for protozoan as well as flukes. One other possibility is fish lice or anchor worms (crustacean parasites). When in the adult stage these can be seen by the naked eye. This is when you notice rapid twitching of the pectoral fins, and you should refer to "Clamped Fins" above, for diagnosis and treatment protocol. Fin twitching and fin clamping are both symptoms of the same possible problems, but in most cases, twitching is a parasite problem. This is when you see them at the surface with their mouths partially out of the water, continually gulping air. It looks similar to when they are looking for food from you, but they move more slowly, and you should be able to see the difference. They will also hang around the surface at the waterfall or water discharge as another related symptom. Either way, this is a sign that they are having breathing difficulties, and they are actually taking a mouthful of air and water from the surface to try and get more oxygen. Again, you must note if it is just one fish or most of them doing it. One fish only points to disease, and if most of them are showing this behavior it points to water quality and/or low oxygen. The reason I stressed the word continually above is because fish will sometimes rise quickly to the surface, take a single gulp of air, and then return immediately to the bottom. This symptom is different from gasping and usually only occurs when you have just relocated new or existing fish to new water or you just completed a major water change. This is a sign that you did not do a good job in acclimating them, but they should cease this behavior in a few hours. It is most prevalent when acclimating new fish from the shipping bags to the pond or quarantine tank. The water is low in oxygen- One of the clues to low oxygen in the water is when the fish exhibit this behavior only in the early morning, at first light. This is due to the fact that plants and algae consume oxygen at night, and by morning there is not enough oxygen remaining to support the fish. During the day, the plants put oxygen back into the water, so the gasping may cease during this time of day. Also, the warmer water gets, the less oxygen it can hold. If this is the case, they will show the signs when the water gets the warmest. You either have too many fish, too many plants, or both, or the water is just too warm to hold enough oxygen. Aerate the water 24/7 with a fountain or air pump and air stone to increase oxygen levels. (Especially at night and/or warm water above 80 degrees) Another big clue (and little known fact) is if any fish die with their mouth open after death. This usually means is was death caused DIRECTLY from the lack of 02 in the water, as opposed to gill dysfunction. Their gills are not functioning properly due to disease, parasites, and water quality, bacterial or viral infections- One of the first things to check are nitrites, as nitrite poisoning will damage the gills and blood cells as well. This damage will cause difficulty in breathing, and if left untreated, it will kill the fish quickly. If nitrite is present, do a 50% water change, and salt to .05%. (point 05 percent). Certain parasites and bacterial infections will attack the gills and cause physical damage to them. I would suggest continuing the aeration as well as the treatments listed below. With these treatments, your goal is to eliminate all parasites, as well as treat for bacterial infections by feeding medicated antibiotic food. NOTE: It is important to understand that bacterial infections are usually a secondary infection, brought about by the stress and other physical problems associated with the parasites and poor water quality. In other words, one can lead to the other. If nitrites were not found, you can assume parasites and/or bacterial infections. You can read more details on treating and diagnosing bacterial infections in the “Koi Treatments and Quarantine Procedures” section of this website. Head down and tail at the surface, but body still upright, acting lethargic and unresponsive. Head pointing up at the surface, but body still upright, acting lethargic and semi-responsive. Sitting normally and horizontal, but physically unable to swim below the surface when disturbed, even though they try. Floating belly up or partially rolled over, and unable to swim upright or swim to below the surface. Since these are symptoms caused by separate problems we will discuss them one at a time. Also be sure to see the symptom "Gasping" for other possible causes. When you see a fish at the surface, not sitting perfectly horizontal in the water, with its head pointing down, and its tail pointing up, and very lethargic and unresponsive, this is usually a sign of a serious bacterial infection. This fish is in trouble and will need immediate attention. As stated previously, most bacterial infections are secondary problems that were brought about by some other prior stress problem such as parasites or poor water quality. Therefore, you will need to address those problems as well, but you will need to strengthen the fish prior to doing so. Check all water parameters, and get the water quality perfect before attempting treatment. When fish are at the surface with their head pointing up and their tail pointing down at an angle, and acting lethargic and listless, check your water quality immediately. Especially pay close attention to the pH, ammonia, and nitrite, in that order. Low or crashing pH is the number one cause of this symptom. Also, if possible, check their gills for problems. Healthy gills should be a consistent beet red color, not pale or patchy. If you do note abnormal gills, then there is a problem with parasites, and/or a bacterial infection. Check all water parameters, especially pH, kH, ammonia and nitrite. 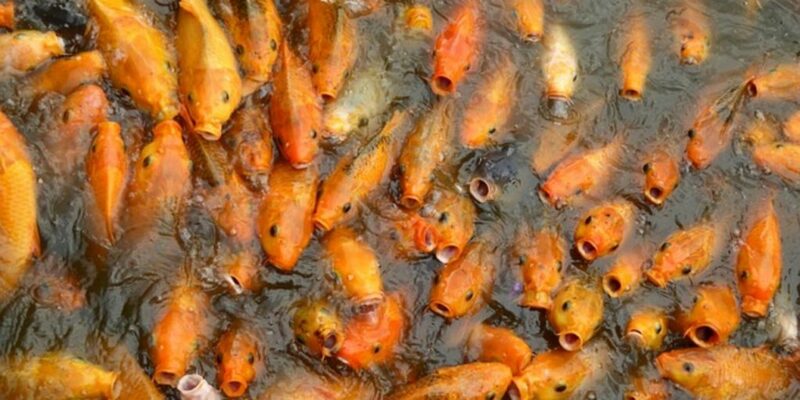 If these are OK see the bacterial section of “Koi Treatments and Quarantine Procedures” and treat accordingly. Both of these symptoms are signs of a swim bladder problem. Please refer to the symptom "Laying Over on the Bottom" for additional comments. The signs of a swim bladder problem include lying on their sides and floating upside down. Sometimes a fish will exhibit this behavior when it has a spinal injury as well, so keep this in mind if the treatments below do not work. Very little is known about this disorder. We do know a few contributing factors are rapid temperature declines, bacterial infections, constipation, and even a poor diet (not varied enough) can cause it as well. 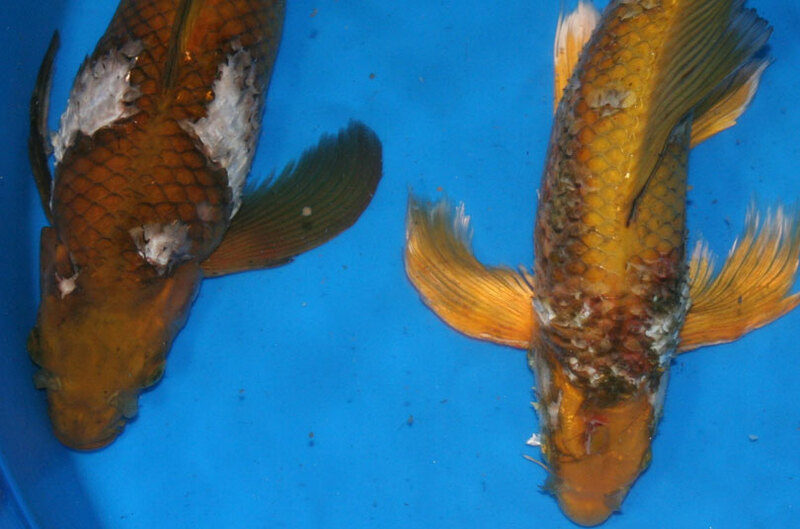 Goldfish are more prone to this disease than Koi, but both species can get it. 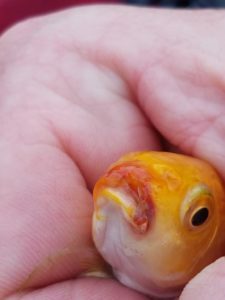 It is suspected that some fish, especially the fancy goldfish, are born with malformed swim bladders, and as they grow, the bladder is too malformed or too small to keep the fish upright. Considering the various contributing factors above, the treatments must be varied as well to cover all of the possible causes of this condition. I would start by putting the fish in a shallow tank or suitable container. The shallowness of the water is important, in that it will force the fish to stay at the surface and not encourage further stress in them trying to swim down. (In the case of floaters anyway) Since cold water is a possible cause, make sure that the new tank is at least 10 degrees higher than the original one. Regardless of the temp of the original tank, it would be best to contain the fish in water in the upper seventy-degree range, but still make sure it is at least 10 degrees higher than the water they are coming from. IT IS VERY IMPORTANT THAT YOU RAISE THE TEMPERATURE SLOWLY! I would suggest raising it no more than one degree an hour, until you reach the desired limit. As for the diet, all fish should be fed a variety of things periodically. No matter how good a food you feel you are using, you must supplement it with other things. Occasionally, feed them live foods such as worms, mealworms, and other insects. Also, fresh vegetables are good as well, although you might have to experiment with different ones to see which ones your fish prefer. It is speculated by some that fresh peas will aid in the healing of this disorder by clearing any intestinal blockages that may be linked to swim bladder malfunction. For these reasons I would suggest feeding your fish with this disorder a variety of different foods, but primarily get some medicated antibiotic food in them. The antibiotics are the primary food they should be fed until healed. Treating these types of fish is hit or miss, and in most cases it is not commonly cured. AS A LAST RESORT, and once you have unsuccessfully tried all of the above, there is a simple (but possibly fatal if done incorrectly) procedure, to treat the floaters or fish stuck upside down. Fish that float upright or upside down have too much air in the bladder, and therefore are unable to right themselves. The fish normally expels excess air from the bladder when it swims down below the surface. By adding or releasing air from or to the bladder, they are able to remain at any desired depth, and be neutrally buoyant. These floaters are unable to do this for all of the reasons discussed. Therefore, you can attempt to release some of the air for them manually. This is not for the squeamish though. It involves inserting a hollow needle or better yet, a syringe, through the side of the fish and into the bladder. In the case of the syringe, it must have a long enough needle to reach about halfway through the width of the fishes' body to where the bladder is situated. The length of the needle will vary depending on the size of the fish. To locate the exact point for insertion of the syringe, simply draw an imaginary line straight down from the first spine of the dorsal fin to a point just below the lateral line. The dorsal is the fin on the top of the fishes back, and the first bony spine of this fin from the head is what you are looking for. The lateral line is a visible line that runs down the center of the side of the body, from just behind the gills and runs to the tail. 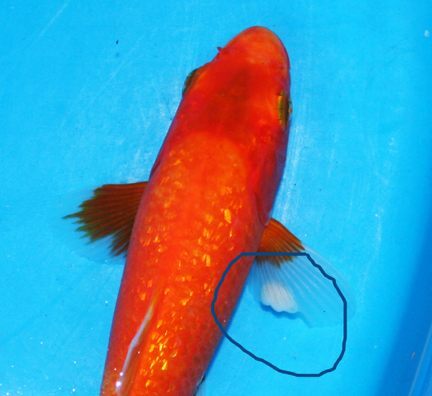 This lateral line is actually a sensory organ which enables the fish to feel vibrations in the water to locate possible prey or approaching danger. On certain species this line is harder to see than on some other species, but with close examination it is easily found. The syringe should be inserted at the point where the imaginary line down from the dorsal fin spine meets the point slightly below the lateral line. Once you have inserted it about halfway through the body, you should be somewhere in the bladder. To test this, simply try pulling the plunger of the syringe, and if it does not move easily, you ARE NOT into the bladder as of yet. You either went too far, or in most cases not far enough, and the needle is still in flesh. Adjust the depth accordingly until you are able too withdraw the plunger. By slowly withdrawing the plunger, you are actually withdrawing air from the bladder. This will take some of the buoyancy from the fish so it can either float upright or be able to swim below the surface now. Your goal is to remove enough air that the fish can right itself, so it may take a few tries to accomplish this. Many fish that you attempt this procedure on may get the symptom again, as it is usually only a temporary fix. Even though temporary, it may give the fish enough time to heal itself, as it will be less stressed and able to feed more efficiently. If you do attempt this, you should also use treatments #10, Debride ointment, as well. The handling of the fish will most likely destroy the slime coat and thus will warrant this protective treatment to avoid a fungus attack. This symptom comes in many forms, but we will address the most common ones associated with some sort of toxicity in the water. Toxic agents are things such as chlorine, chloramines, ammonia, household bleaches or detergents, hydrogen sulfide, and heavy metals such as copper or excess iron to name a few. Fish suffering from poisoning will exhibit certain erratic swimming behavior. Some fish will swim slowly upward, only to stop and sink slowly toward the bottom. Others will dart quickly and erratically and sometimes bounce off the walls in the process. Another sign is when they swim in a corkscrew pattern by continually rolling while swimming. With most of these symptoms, the fish also seem oblivious to everything around them and will not show any signs of fright. The first thing you should do is a 50-75% water change, but you should read below for more details as well. Tap water from municipal treatment plants, are treated with chlorine and chloramines to make it safe for human consumption. Unfortunately, these compounds are highly poisonous to fish and need to be removed or detoxified before introducing the fish to such water. Tap water can also contain ammonia and heavy metals, and it is for this reason that you must treat the water with a dechlorinator or water conditioner that will remove or detoxify them. We use Ultimate Water Conditioner which we sell in"Products" catalog of this website. This conditioner will detoxify or remove chlorine, chloramines, Aammonia, Nitrite, and heavy metals. It is one of the few products that will do all of these things. I highly recommend its use. Well or spring water can also contain some agents that can harm fish as well. The most common are ammonia, nitrite, nitrate, and heavy metals. As with tap water, you should also treat your spring or well water to eliminate any problems associated with these compounds by using a quality water conditioner as mentioned above. With tap or well water, it will benefit you to test it prior to putting fish in it. You should test all parameters you can, but especially ammonia, pH, nitrite, nitrate, kH, and temperature, especially if you are doing a water change or relocating the fish to new water. You must make the new water chemically identical to the existing water, and the temperatures must be within two degrees of each other. You must acclimate the fish chemically as well as for temperature to assure the health of the fish. Refer to “Water Changes” in the treatments section. When you have a fish that permanently isolates itself from the rest, when normally it would be with them, this is a sure sign that something is wrong with it. In most cases, this will not be a water quality issue, and will be more so a parasitic attack, or a viral or bacterial infection. Parasites are the most common cause of this symptom however. You should still check all water parameters to be sure. Sometimes, a prior water quality problem can cause a viral, bacterial, or parasitic outbreak, and just as with people, some fish are just more susceptible to such outbreaks as compared to other fish in the same tank. Without the use of a microscope, I would do a shotgun type of treatment, once poor water quality is ruled out. With this method, you should do the treatments in stages, and only as needed. I would first treat for Protozoan parasites, and then for Tremetodes if the symptoms persist. These are symptoms that can be seen with the naked eye, and may show up at any given place on the fish’s body, head, and fins. Red sores on fish are referred to as ulcers. 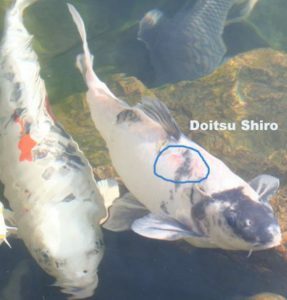 The beginning of these ulcers start out as pink/red spots or areas, and can appear just about anywhere on the fishes' body. These spots gradually turn into open wounds and will continue to spread wider and deeper if left untreated. Eventually, and if they live long enough, they will develop "Dropsy" and die. These wounds can sometimes be low on the side of the fish and hard to see. The fish below has an ulcer. Can you see it? Notice the slightly raised area as shown by the arrows. In the first and second photos, you can barely see a raised area on the left side of the fish about midway on the body. The third photo is a side view where the problem is easily seen! So as you can see, some issues are very subtle and it takes a trained eye to notice potential problems such as this. Ulcers are usually caused by a bacterial infection invading an area that has been previously degraded or attacked by parasites, physical injuries, or by poor water quality degrading the fishes protective slime coat. More specifically, ulcers are usually the result of invasion by the bacteria known as Aeromonas, and even more specifically by the strain Aeromonas Salmonocida. It is a little known scientific fact, that the strain Salmonocida are the only strain of aeromonas to actually CAUSE the ulcers to form on Koi. Other secondary bacteria will invade the ulcer site once th Salmonocida make the ulcer, and they will need to be addressed as well. An important fact when treating for Salmonocida is to heat the water to 82 degrees F. This strain cannot live at this temperature, and you can only then begin to threat the wound. This in itself will go a long way in helping the fish heal. Bacterial infections with the exception of Columnaris bacteria are usually a secondary problem caused by other stress factors first attacking and weakening the fish. In basic terms, the fish are usually protected from the pathogens that live on them and in their water, by their immune system. Most of their immune systems bactericides are housed in the slime coating on the outside of the fish. When parasites are able to penetrate this layer due to stress factors, the bacteria just follow them in. So as you can see, the poor water quality and/or an overwhelming population of parasites lead to the breakdown of the immune system, which in turn leads to infections. For these reasons, you must treat for Aeromonas bacteria as well as parasites, and most importantly correct and maintain impeccable water quality especially during, prior, and thereafter the treatments. The first thing to do is correct any water qualities issues and have a filter capable of maintaining this, whether it is a hospital tank or your pond we are referring to. The next step is to clean the wound and surrounding area using some sort of antibiotic ointment such as Neosporin Ointment and/or iodine swabbed over and around the ulcer. Do not treat the wound site more than one time with iodine. If the wound requires series of topical treatments then use the neosprin only after the initial treatment. Be more gentle with each treatment as to to promote healing. There is another tutorial on this site that addresses ulcer treatment in great detail. Red rashes on fish can be cause by water quality issues, parasites, bacterial infections, and more rarely sunburn. The number of fish exhibiting the symptom, combined with how rapidly it came on, are huge clues as to the possible culprit. Common sense dictates that if it came on quickly and affects most of the population that water quality of some sort is the issue. So as always and no matter your guess on what the culprit is, test all water parameters. If the water test OK then start investigating the pathogens above. Below is an example of a sunburn case. This would be rare in an ornamental pond, but it becomes more likely if your water was gereen for a long time, then you suddenly cleared it up with a UV light or water change. A few years ago I had a diagnosis problem with some of my breeders that had been recently pulled from the mud ponds. They were in the beginning days of the standard and usual treatment regimen when some of them started getting a mysterious rash. This rash was worsening daily and becoming life threatening. I was pressed to find the answer quickly or I was going to lose some valuable breeders. I had to figure it out! Many people would have instantly blamed this rash on being a "bad reaction" to the treatment chemicals, or from the use of salt and certain treatments together or dosage rates. They would have been wrong! What I eventually discovered has led me to look at diagnosing fish ailments from a whole other perspective. This will also help you whenever you have to figure out what may be wrong with your fish if they have any health issues. When we pull fish from the mud ponds, they always have parasites to some degree, and we always treat them as quickly as possible after pulling them. However,also when we pull them with the seine nets there is a lot of mud in the nets by the time we finish the pull and start removing the fish. This muddy water in the corralled net causes a liquid sandpaper affect on the fish and can have a detrimental effect on the slime coat. This is especially true in colder water, and this in turn will have a great bearing on not only what we use to treat the fish, but when we begin that treatment regimen after they are pulled from the ponds. Their slime coats are always affected to a degree; it is only the degree that changes from pull to pull. Remember this, as it greatly affects what you are reading. The following day after pulling them they were scoped and found to have the normal flukes and Trich, but they were pretty infested with both in high numbers. Concerned about the number of parasites, I decided to forgo my normal two day waiting period before treating, and treated the next day after pulling them. They were put into crowded systems and I was concerned about the bugs going crazy in those crowded conditions and causing bigger problems quickly if I did not address the infestation ASAP. It is a normal judgment call we are always faced with in a commercial operation. If the fish have little to no slime coat after pulling them, I like to give them a few days in low salt to help rebuild the slime layer. However, sometimes the bug infestations can be bad, and if we don't address them in a timely manner, the bugs can do more damage in a short time frame, than the risk of treating fish with little to no slime. We will discuss this whole slime coat integrity thing in another article, as this is a critical factor in determining what to use, and when to use it. These particular fish generally looked and acted very well when I put them into quarantine. This batch was split and put into three separate quarantine systems. Two systems were inside the quarantine building and the third one was a system that was outdoors. Each of these systems firstly got the normal .2% salt solution. We utilize the salt primarily to calm the wild fish, promote slime regeneration, and slow parasite reproduction. Salt no longer kills many bugs, but it does still have its purpose. Now some folks say that salt mixed with certain other treatments causes a "bad reaction" in fish, but we won't even go into that debate here. We will discuss that myth another time. When we treat around here, we have a host of primary products we use for protozoans: ProForm C, Quick Cure, PP, as well as a couple we use for flukes; Prazi and Fluke Tabs primarily. There are others as well, but these are the primary ones we utilize. Which one we use for each type of bug depends on a few variables. We will get to that later. But most of it has to do with slime coat integrity at the time of treatment. In this particular case I used one standard dose of Quick Cure (37% Formalin with malachite green) combo, because it is stronger than ProForm C in solution of both the malachite and the formalin. The reason I chose this treatment was because I wanted to knock down the bugs quickly due to the degree of parasite infestation, as well as the risk of it getting worse in the crowded conditions of the quarantine systems. This treatment was utilized in the exact same dosage rate in each of the three quarantine systems. During the first treatment in the outside system, the fish flashed quite a bit that afternoon around 5PM. I had put the treatment in at 7AM that morning however. My first thoughts were that it was caused by the treatment itself, as Quick Cure can cause this reaction due to its strength, or it was simply the bugs becoming more active during the treatment and moving around on the fish more as they were reacting to/being killed by the treatment. This flashing reaction can be quite common, so I was not that concerned on that first day. They will usually stop after that first treatment. I did have some thoughts as to something in the water parameters, especially pH (because of the afternoon flashing) but I had checked everything and all was well. I still did not completely rule out water parameters yet, however, as I simply wanted to give it a day before pursuing it further. NEVER rush diagnosing a problem/symptom. The fact that MOST of the fish in only one of three quarantines were flashing is what led me to suspect water/treatment issues over the bugs, but it was too soon to tell, and the water tested fine. The fish in the other two quarantines were flashing only slightly, and only a small percentage of them. Keep in mind that all quarantines concerned with this batch were treated the same each day, and all water parameters were identical in each. The second day, I did a 90% water change, replenished the salt to .2%, and re-scoped the fish. The Trich were gone/dead, but the flukes remained in force and alive as expected, as Quick Cure will not kill them. The fish continued to flash and more frequently in that one quarantine, and I had more jumping as well. The symptoms were progressing for sure in that one system, but the fish in the other systems were getting better and looking well with little to no symptoms. Again, I suspected the heavy flukes were the culprit of the symptoms, but wondered why the symptoms had increased in only that one system. Again, I was not all that concerned, and wanted another day to see how they would act then. On the third day, I added the Fluke Tabs to address the heavy infestation. Now, right here I'll bet some of you are saying "no wonder they are flashing, you are bombarding them with chemicals!" Well, we do it all of the time here and have very few issues. You have to understand the difference between a commercial operation as compared to a hobbyist pond of a few fish. We deal in thousands of fish at a time, and most are quarantined in crowded systems due space and economics. This crowding can cause the parasites to multiply quickly and thus do more damage than successive treatments can. In intensive aquaculture we are always forced to pick between the "best" of two evils, and in this case as usual we chose to knock back the bugs quickly. We can accept small loses that this may or may not cause, and this is the difference. This is another case of "do as I say not as I do" or..."do not try this at home" type of thing. There is a big difference between how I do things in the commercial world, as compared to what I would suggest a hobbyist do in their ponds. Please understand the difference. The fourth day in the problem quarantine system showed another increase in flashing and jumping, and now fish were showing signs of reaction of some sort. They were getting a red rash look, and noted to be primarily on their backs only. They were also starting to clamp their fins and sit on the bottom. I again re-scoped the fish in all systems and found the expected few flukes remaining on the fish in all of the quarantines concerned. Not near enough to cause these symptoms in this one system. No other bugs were found in any systems of these fish as well. At this point I did EVERY water test I have, and EVERY system was identical in every respect. At this point I was becoming very concerned as to what was causing this in this one particular system and not in the others. Remember, these are all the same fish from the same pond, and they were all treated identically. The 5th morning, the fluke tab treatment was finished, and the flukes were gone for the most part. The fish in the problem system were again looking worse, and the redness and other symptoms were increasing! So, I did another 90% water change which I would have done regardless after the Fluke Tab treatment. On the sixth day, nothing much changed, but here let me note that I realized that the flashing was always worse in the afternoon, as well as the redness on each fishes back. This got me thinking in another direction. Long story short, I realized that this system gets full sun 85% of the day and the other systems do not and are inside or shaded. A light came on in my pea-brain at this moment of realization! Now I have always preached about noting the fishes' slime coat integrity before treating with anything. 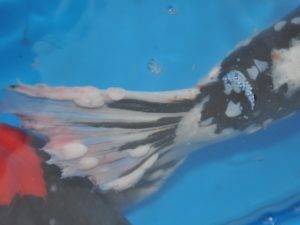 If you treat fish with little to no slime coat, you will most likely have problems with reactions, and even cause deaths, and lessen the chances of a successful treatment. Then the treatments do more damage than the bugs. As discussed above, I knew these fish had little slime coat when going into quarantine, but by the next morning they did have some. In my experience it was enough slime coat to be somewhat assured that the treatment would not affect them. Keep in mind as well, that only one of three systems had these issues, and EVERYTHING was the same amongst them except for SUNSHINE! Two of the three systems were either indoors with no sun or 85% shaded all day long. Only the one system was outdoors, clear water, and 100% sun 85% of the day. Basically put, treating the fish with this little slime coat took them over the edge of what they can handle and allowed the sun's UV to penetrate and irritate the skin. Another important clue in all this is the only fish that were affected like this were fish that were non-metallic and white. Even upon very close examination, the other colors (even on the same fish) were not affected as badly as the white areas. You can see in the photos below what I mean. There was no discrimination from Doitsu to Wagoi either, only the fact that non-metallic white is more sensitive to the harmful rays of the sun. Moral is, don't be so quick to blame the meds...or anything for that matter. Take it one step at a time and you will most likely find the "true" culprit. The slime coat being minimal was the first problem, then the treatments weaken the slime layer further and irritate the skin to a degree as well, but the sun was the primary factor that caused the rash. Since this occurred a few years ago, I have tested and proven this sunburn condition to be true multiple times now. I have also learned that simply pulling fish from a mud pond that has tinted green water and then putting them in clear water that is exposed to direct sunlight in itself can be damaging. It makes perfect sense. The fish live most of the time in the water of the mud ponds that sunlight does not penetrate. This in turn leaves their skin more sensitive to direct sunlight when they are exposed to it. So you to can apply this to your own ponds. Many ponds and watergardens go through green water stages at times. If this goes on for extended periods, then the water clears, you may want to consider adding more shade to the ponds to avoid the same issues I have discovered. You would do this shading for a period of time as to let the fishes skin slowly acclimate to the more intensive direct sunlight of the clear water. 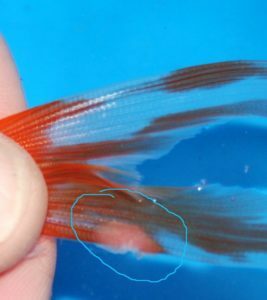 When a fish has this white to off white/gray fuzz growing from spots on its body, this is most likely a fungal infection called Saprolegnia, or a bacterial infection called cotton-wool/Columnaris diseases. It is possible, however, that it could also be a colony of Epistyles, which is not a fungus or bacteria, but is a parasite, and is less common than the latter two. Some people say that all of these appear the same on an infected fish, but I tend to disagree. It may be that I feel this way because of my experience, but I feel that there are obvious differences. Under a microscope they are quite easily differentiated, but because this section is primarily dedicated to those of you who don’t have one, I will give you my opinions based on naked eye examination. As stated above, Saprolegnia (Sap) is a fungus, and once a fish gets infected, it will usually grow much faster than the colony of Epistylis or Columnaris. Sap also prefers colder water, so look for it in the Spring and Fall of the year. Saprolegnia appears more hair-like, and even in the initial stages grows in a more defined cluster straight out from the infected area. Epistylis, on the other hand, starts differently, as it seems to appear as it is squished out from under a scale of the fish, causes reddening, and spreads sideways first. Epistylis and Columnaris are also much slower in forming the cottony/fuzzy appearance. All of these can develop a green to brown coloration over time, but Sap is usually the quickest to obtain this coloration. This coloration is due to algae forming amongst the fuzz, but Sap is more likely to promote this algal growth in a shorter period. Below is a breakdown of the three different afflictions. Epistylis is a parasite that is found in dirty water or ponds that have infrequent water changes and a buildup of mulm or debris. It forms as colonies of bell-shaped individuals connected to stem like shafts, and under a microscope it resembles a bush with buds at the ends of each stem or branch. In its initial stages it appears to grow out from under a scale and spread sideways and over the next scale in line. It will usually infect multiple areas on the fish at one time and grows flat against the body. The infected area will usually have reddening associated with it as well, and it will resemble a rash. If left untreated, it will eventually grow outward to form the cottony tufts or fuzz, but it takes quite a while for this to become visible to the naked eye. It can sometimes be killed with a combination of salt treatments at .3% and water changes, but I prefer some of the other listed treatments below. Proform-C or some other malachite/formalin mixture works best. It is also a good idea to do a thorough cleaning of the pond or tank. 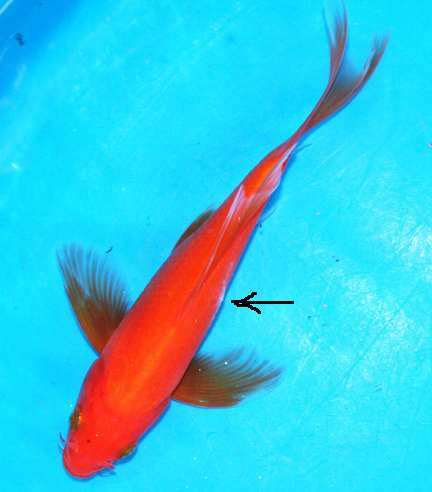 Mouthrot, saddleback, tailrot, cotton-mouth, bacterial gill disease, cotton-wool disease, the fish funk- it goes by many names in the Koi hobby and the aquaculture industry but all these ailments are the result of one specific type of bacteria- Columnaris ( Flavobacterium columnare). With this article, we tell you what it is, how to diagnose it, and key tips on its prevention and treatment. 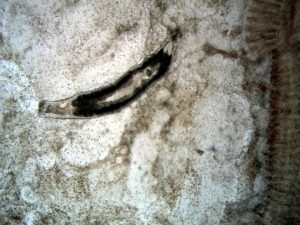 This species of bacteria is one of the most common killers of Koi in the hobby and especially in the professional world of intensive aquaculture. In our many years experience, it is our theory that it is responsible for many more fish deaths than have been reported. If you’ve ever lost a fish due to a bacterial infection (maybe given one of the common descriptive names seen above), chances are this nasty rod-shaped bug is responsible in one way or another. Columnaris is a flagellated bacteria (i.e. it has a kind of “tail”) that is anaerobic and feeds on a variety of fat and protein rich organic matter- and it loves to chew through fish tissue! Anaerobic simply means it doesn't require oxygen, so it thrives in the muck in dirty and especially overcrowded systems/ponds. Colonies can resemble "haystacks" under a microscope, or patches of yellow-white fuzz or cotton to the naked eye. These colonies create lesions on the fish’s skim coat, gills, fins, skin, and organs as they eat away at the fish’s flesh. The pictures shown here are different examples of columnaris infections. Note that the yellow-white fuzzy colonies may or may not be visible, and when seen by the naked eye are easily confused with fungal disease like Saprolegnia. The only true way of discerning between the two is with the use of a microscope. This is a more advanced diagnostic tool. For now we will only discuss Columnaris here in detail. However if you desire you can learn how to tell the difference between the two here: https://goo.gl/c8u5Xc) . These fuzzy patches of columnaris colonies may also be green or brown in appearance as species of algae start to grow on top of the hair-like bacteria colonies. Trademark places that this bacterium attacks and degrades on a fish are the gills,(aka "bacterial gill disease) around the dorsal fin on top of the fish (hence the name “saddleback”), the mouth and face ( referred to as mouthrot), and tails and fins (aka tail and fin rot. Columnaris can also invade the skin, and start colonies underneath individual scales- making it looks like there is a white/yellow velvety looking area oozing out from under a raised scale. Once this happens, over time is when the algae starts growing and giving the area a fuzzy looking brown or green appearance. When Columnaris breaches the fish’s slimecoat and skin, it then invites other, equally nasty bacteria to get a grip. 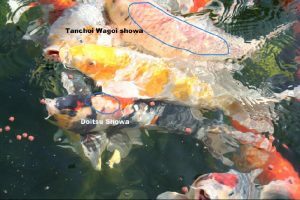 One such secondary infector is Aeromonas salmonicida- the most common bacterium responsible for ulcers in ornamental Koi. Columnaris breaches the walls so Aeromonas and many other harmful bacterium can invade. Columnaris is highly dangerous to fish- and often results in mortality due to suffocation caused by gill degradation, starvation due to the loss of the mouth structures, or mass tissue/ organ loss. It’s a gruesome pathogen. This particular bug spreads by fish-to-fish contact, but more so from ingestion (eating or breathing the bacteria cells), or just contact with free-floating cells which are capable of “swimming” short distances in open water using their “tails”. Once a cell contacts the fish’s mucus layer, (or lack thereof especially), it adheres strongly. If the fish’s has poor slime coat integrity it can’t fight it off, and it quickly multiplies and starts dissolving the skin and tissue. You see the fishes slime coat has built in bactericides, fungicides and other properties that fight of many pathogens. If that slime coat gets damaged by things like poor water quality, physical injuries, chemical additives and snakes oils added to the water, these harmful pathogens quickly attack! Think of the fishes slime coat as its armor, and if that armor gets damages by the things mentioned earlier then they become vulnerable to attack! Here is the key thing about columnaris- it especially thrives and multiplies into deadly infections in DIRTY and/or CROWDED systems. Lots of organic material (muck in a pond or filtration), or a huge fish load provide a bountiful food source and even a prime living environment for columnaris. Columnaris can quickly form a dense biofilm on the aerobic surface of the muck- where koi love to root for food. In such systems it’s a matter of time before cells from the numerous colonies make their way onto your fish and start chewing away. Prevention is key with this type of pathogen! Understand however that these and other type of bacterium and parasites live on fish at ALL times! It is the numbers of them as to what dictates if and when they affect the fish with disease symptoms. Any form of stress to the fish from poor water quality, handling, and other things previously mentioned, and all hell can break loose quickly! The BEST way to prevent an outbreak is to MINIMIZE the amount of organics in your pond. This is achieved by proper filter maintenance and media type , (reduce muck buildup ) moderating your plant and fish load,( don't overstock either), proper feed rates (don't overfeed to the point there is food left to decompose in the water), and total proper system design are the key things to address. A well-designed pond with a BARE bottom (no rocks/gravel) and a bottom tied directly into the filtration is another very important design aspect to keep these pathogens in minimal numbers. Basically put "good housekeeping of the filtration and pond are the number one preventative measures in keeping this bacteria at bay. These are extremely durable, easily installed in new pond builds, and will keep your pond bottom clean. Using a high grade bottom drain makes leaking nearly impossible, but some pond builders use this threat as a means of trying to talk people out of using these bottom drains. Don't let that do that to you. Having a bottom drain tied into the filtration is a must as far as we are concerned. Much more difficult than prevention, a pond with fish displaying visible columnaris infections should be treated carefully with salt first- and then potentially with stronger antibacterial treatments – See the HKF Koi Treatments page for details: https://goo.gl/a7YuWr Basically put though always use our salt regimen as the first attempt and give it two weeks to see if it helps. If not it is then time to use other stronger types of treatments, like Diquat, Potassium Permanganate and some others we sell. It’s the goal of HKF to educate you as hobbyists, as well as the retailers of Koi and the pond builders especially so you can protect and enjoy your precious pets and ponds for decades to come! Share this article if you, or a friend so more people can learn how to prevent these losses. Email us at [email protected] to have us design an ideal pond for you. Saprolegnia is a cold water fungus that is usually a secondary infection that grows on wound of some sort or wherever the fish's slime coat has been depredated. Ulcers or sores, left untreated, are prime incubators of such an affliction. Also when a fish’s slime coat has been disturbed from things such as handling the fish with dry hands, abrasive nets, or when they jump from or are dropped to the ground, this fungus is likely to appear. It usually starts as a white patch, which quickly forms into the tuffty/fuzzy hair like mass. Because it is a secondary affliction, you will need to address the initial cause for a complete cure, but either way you should treat the area of the growth. Swabbing the area with iodine or Debride medicated ointment can do this. In swabbing, you want to be aggressive enough to eliminate the fuzz, as well as any dead or infected skin tissue. This may need to be done on two separate occasions, but I do not recommend more than this. The area or wound will show signs of healing when the outer edge appears white or pink in color. This is due to the fact that these wounds will heal from the outer edge and work in towards the center. In the case of a fish jumping from the pond or tank and becoming dry, I would highly recommend treating the entire fish with Debride ointment. If you don’t, the fish will take on a "Chia Pet" appearance, and be completely covered by the fungus. If you allow this to get to this stage, it will be nearly impossible to save them. Even though Epistylis and Saprolegnia are completely different afflictions, there is one treatment that will simultaneously kill them. That treatment would be ProForm-C or Quick Cure. The Columnaris, however, will be a little trickier, as it is a bacterial infection and will require antibiotics. Due to the fact that you may have difficulty diagnosing which pathogen you are dealing with, you may want to first try the ProForm-C alone. If you do not see healing, then proceed to the listed antibiotic treatment of Tricide-neo. It would also be a good idea to isolate the fish to a tank, as opposed to treating the entire pond, but either way the pond should be thoroughly cleaned, especially if Epistylis and/or Columnaris are suspected. Carp pox appear as smooth, shiny, waxy looking, off white to gray lumps, and can pop up anywhere on the body, head or fins. 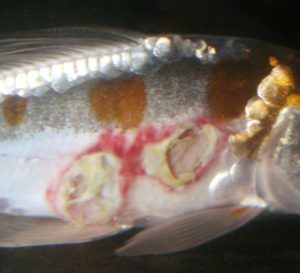 At times, especially when the lesions are on fins, you can see small blood vessels leading to the site of the lesion from the sorrounding area. This is quite common, but as well a lesion from where an anchor worm is or was once present can have a very similar appearance. So keep this in mind as well. You can see photos below of how similar these can look. The first photo is carp pox, and the second is an anchor worm site. Carp Pox is not a pox at all, as the name implies. It is a simply Herpes virus which causes abnormal dermal cell growth and/or neoplasms, very much like that of a wart on a human. No, it is not the same Herpes virus as in KHV ( Koi Herpes Virus/ Cyprinid Herpes Virus 3) that is wiping out many fish around the world. We will discuss that more deadly virus in another article. Specifically and scientifically, Carp Pox is referred to as Cyprinid Herpes Virus -1 to be exact. It is a harmless aesthetic problem that is very common to Koi. As this is a virus, it can be contagious. However, I have found that that is not a real threat in most average situations. However, the likelihood of it spreading increases as the fish load increases and as the organic load of the system they are housed in increases. In other words, if your pond or tanks are very crowded with fish, or extremely dirty, than it can more easily spread due to the increased degree of physical contact between fish. 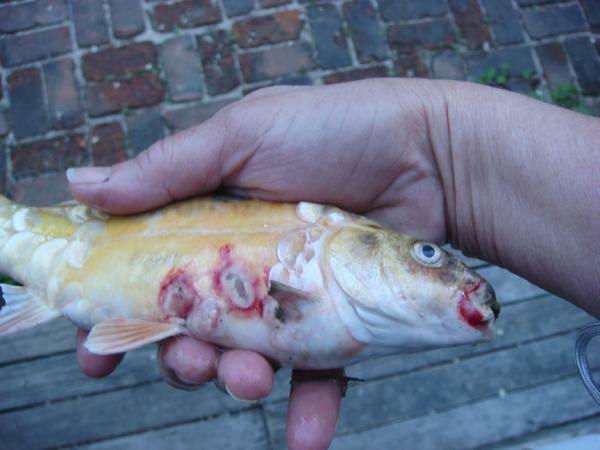 Although Carp Pox is most common in crowded, dirty systems, this is not always the case. They can also show up as areas of slightly raised “patches” of the same colors, as opposed to a lump. Some people describe them as areas that appear to have had white wax dripped on them and allowed to harden. Another description would be that they appear to have had white glue (Elmers Glue) dripped on them and allowed to partially dry. In the past it was said that these lumps or patches would only appear in cold waterand disappear when the water warmed to the upper seventies. It was also previously thought that these viruses spread easily from fish to fish. This can sometimes still be the case, but I have noted what appear to be multiple strains of this virus, and I do not agree with these previous observations. The ones that appear as "lumps" are the type that seem most responsive to disappearing with warm water after showing up in colder temperatures. The patchy type seems to have the opposite reaction, show up in warm water, and sometimes go away as the water cools down. Neither form is 100% responsive to temperature changes though. Most times the lumps will go away on their own, and sometimes they just get worse. There is no known cure for this herpes virus, but it is still worth trying the heating therapy. Both strains can spread rapidly from fish to fish especially in crowded, dirty systems, but the lumpy type seems to spread the easiest. However, I know longer think that fish need to be isolated from the rest if the heating does not work. I do feel that dealers and breeders need to get infected fish out of their systems due to thew crowding that usually occurs in these commercial operations, but I don't feel the average hobbyist needs to be concerned with isolating fish from their general populations. For a hobbyist, I would recommend isolating the infected fish if possible, and heating the water to eighty degrees for two to four weeks to see if any remission is noted. If after four weeks you do not see remission, I would give up and return them to the pond or get rid of them if they have lesions on a large percentage of their bodies. Some people, myself included, have success by surgically removing or scraping the pox. I personally have never had any success in doing so unless it is only one or two lesions, however. If there are many lesions I do not attempt this method. I usually just wait and see if they go away on their own. It is also speculated that environmental conditions such as pollution have a direct impact as to the cause of the virus, and in my experience I find this to be true. Basically, in most cases Carp pox is nothing to be concerned with unless you have crowded systems like a commercial operation. Ich on a black Ranchu Goldfish. This stage of the parasite often resembles salt sprinkled on the fish. Most people refer to this symptom as white "spot" disease or Ich, but I feel that white spot is not always an accurate description. The official name " Ich" is short for Ichthyophthirius multifilis, (but who can say that!) and they are parasites. They appear as tiny, pinpoint specks (not spots) that are sometimes reflective, shiny, or whitish in color. It will depend on the background color of the fish as to what color the specks appear and how easily they are seen. They look like pinpoint whitish sparkles, and are most easily seen on clear areas of the fish such as the fins and tail. 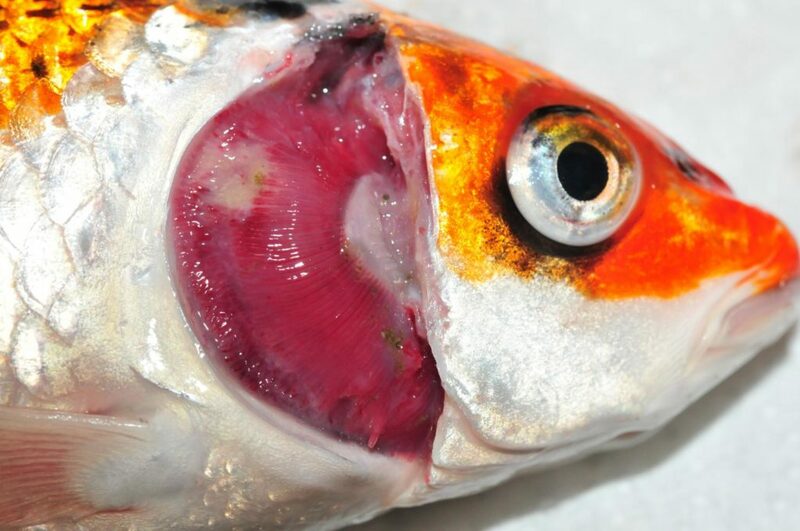 NOTE: In the spring of the year, male Koi and goldfish get "breeding spurs" on their gill plates, and pectoral and sometimes dorsal fins, and these are quite often mistaken for Ich. These spurs are tiny spikes that aid the males in sticking to the females as they push on her abdomen to induce her to lay her eggs. On goldfish they can sometimes be visible year round. Salt at .3% can kill or knock back Ich, but I prefer to use a broad-spectrum parasite treatment. This is primarily because I feel that if Ich is in there, than other parasites are as well, plus the other treatments simply work better. Also, if I am going to treat a pond, I would rather use a F&MG rather than salt that will harm your plants. I would also just go ahead and treat for flukes while I was at it. With any combination of the symptoms above we are most likely seeing the results of an advanced case of abdominal Dropsy. This is a serious and life threatening condition, so you must act quickly to have any chance of saving the fish. It is so serious that some folks say it is not a curable condition once it gets too advanced and the fish exhibit all or most of the above symptoms. This is not true, however, and some of these fish can be saved. One factor that determines the odds of curing this is what type of Dropsy it is or what caused it to begin with. We will discuss this in detail further on in this article. Basically though, Dropsy is a bacterial infection, and is also called "pinecone disease" The reason is that the scales on all or part of the body are sticking out and this resembles an open pinecone in appearance. In most cases, true abdominal Dropsy will cause the scales to stand out on the entire body as opposed to only on parts of it. The reason I mention this is because there is another illness that looks similar to Dropsy as far as the scales go, but they may only be standing out on one part of the body, or primarily on the front of the body towards the head. We will discuss that later. There is also another disease that can cause only one eye to bulge as opposed to both eyes in Dropsy cases. We will discuss that as well. There are four primary yet separate reasons fish get Dropsy. With three of these cases, they are bacterial in nature, and one is not, and is more environmental in nature. The primary difference is in the expected healing success rate of each of them. Some cases are more easily healed than others, depending on the original causative factors. We will talk about these individual cases and discuss why they occur, but first let me explain some other related things. First of all you have to understand that a healthy fish is watertight. They cannot have water get into their systems in places it doesn’t belong or in excess amounts. Because fish have very thin membrane which separate their bodies from the surrounding water, excess water can get into their systems. Now, depending on the varied levels of salt from the water as compared to the internals of the fish, they must constantly regulate how much salt to maintain, and how much water to expel. In other words, they must get this water out of their systems, yet also maintain a certain salt level in their bodies. This is true for all freshwater species. However, saltwater species have the opposite occur. They need to expel excess salt and struggle to maintain a proper water level. So, in speaking of freshwater fish, they need a mechanism to be able to expel the water yet keep the salt in their systems to a .9% ratio (in Koi). So how can they expel the water and leave the required salts behind? This is where something called the osmoregulatory system comes into play. Basically put, when a fish urinates is when this whole thing takes place. The Osmoregulatory system functions to release excess fluids and does this in a way as not to let the salt go with it in the process. We won’t get into the exact details of all of this, but you do need to understand how and why this happens. The kidney places a major role in this whole process. Now back to the four primary reasons fish get Dropsy. In the first situation we will discuss, Dropsy can be caused directly by ulcerations in the body. As you know, ulcers are caused by a bacterial infection, and as these are usually secondary in nature, most likely another factor was involved like parasites or poor water quality. These issues, of course, must be addressed as well prior to attempting any further treatments. So this first case of Dropsy was caused by parasites and/or poor water quality, followed by a secondary bacterial infection that caused the ulcerations, and thus these ulcerations caused the Dropsy. Basically, these ulcerations allow the fish to take on water so to speak, as they are no longer watertight due to the breaks in the skin caused by the ulcers. When they start taking on more water than their osmoregulatory system can manage efficiently, this is called osmotic pressure or osmotic overload, and the kidneys have to work much harder. This added stress can cause kidney failure, and then the fish loses the ability to get rid of the excess water and maintain a proper salt level in their systems. Another factor to understand is that we know ulcers are caused by Aeromonas bacteria, and thus these bacteria can simply invade the kidney as well and cause it to not function properly. 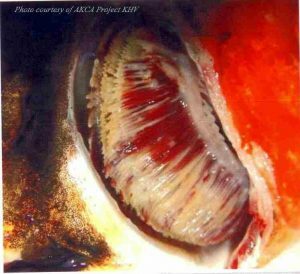 No matter the reason, when this kidney failure occurs, they literally swell with fluids, and their eyes start bulging out from the excess pressure of those fluids building inside the fish. Now with understanding all of this, if you see a fish that is showing signs of this disease, you must act quickly. Firstly capture it and inspect it thoroughly. This inspection will give us clues as to why the fish may have gotten this disease. We will discuss this soon. Once you have inspected it, you should put it into quarantine and gradually raise the water temperature to 82 degrees. Oh, by the way, it is best to put a “buddy’ fish in with it, as Koi do not like to be alone. The added company will help them feel less stres, and this in turn will help them to fight the disease. Another reason for the specific temperature is because in many cases this disease is bacterial in nature and caused by Aeromonas Salmonicida. So this temperature will not only start killing that bacteria, but also at this temperature, the fish's immune system can function at its peak and help the fish to fight it themselves as well. Another critical aid in curing Dropsy of any type or origin is maintaining a salt level of at least .6% (point six percent or 6 ppt). Remember how these freshwater fish must maintain their internal salt levels? Well, maintaining these higher concentrations in the treatment tank will take some pressure off of their already overworked osmoregulatory systems. At times I have even maintained as high as .8% salt in the system in the most advanced cases. You should never exceed this amount however, as you do not want to exceed the fishes internal salinity of .9%. With Dropsy that is caused originally by these ulcerations, you should understand that we first need to heal the ulcers before having any hopes of curing the fish. We must “patch the hole” so to speak. Since we know ulcers are caused by Aeromonas bacteria as well, we must treat for those in the process. So you should pick the appropriate antibiotic regimen from the “Treatment” section and proceed with it. In summary, for treating dropsy caused by ulcers, salt the system to .6%, heat the water to 82 degrees F, and treat for Aeromonas infections as well. Also you should treat the ulcerations with a topical treatment to further aid in healing. There is a picture tutorial of one suggested protocol for this in the article entitled “Ulcer & Wound Treatments". 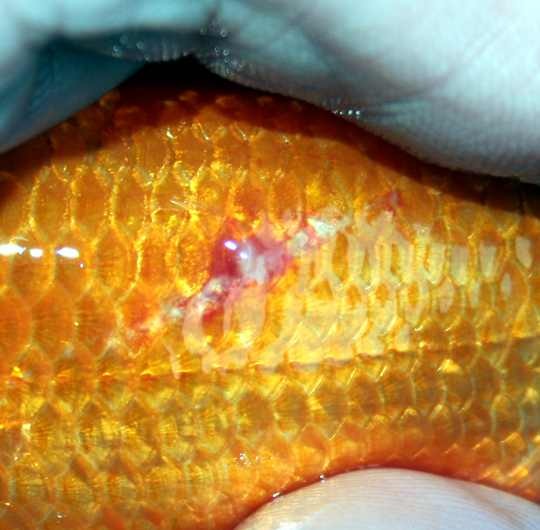 The second way for Dropsy to occur is when a fish gets some sort of physical injury like a cut or scratch. When this happens the injury itself can become infected due to the ever present pathogenic bacteria that commonly live in our ponds/ holding systems. They are always waiting to strike and enter the fish through any available break in the skin. In this case, these injuries become infected as discussed, and then turn into full-blown ulcers. 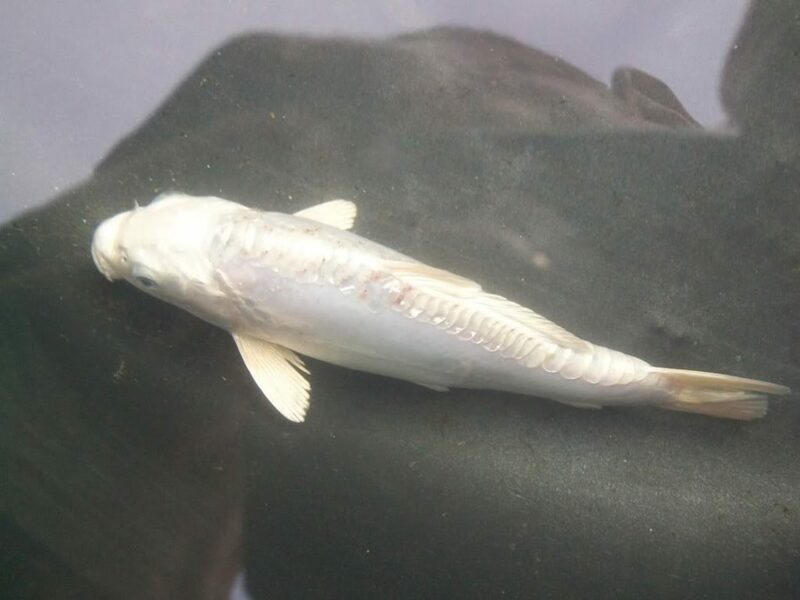 These cases usually have a better percentage success rate in healing because the fish is being attacked from the outside, and thus it may take a little longer to affect the kidney as badly as an internal type bacterial infection. Again, this should be treated just the same as the previous type of Dropsy occurrences, but you will generally have a better success rate in curing it if you catch it early enough. Now the third way for a fish to get dropsy can also be caused originally by a bacterial infection, be it Aeromonas (the most common) or Columnaris. In this case however, let’s say there are no ulcers, and the bacterial infection went directly to the kidneys which is very common as well. 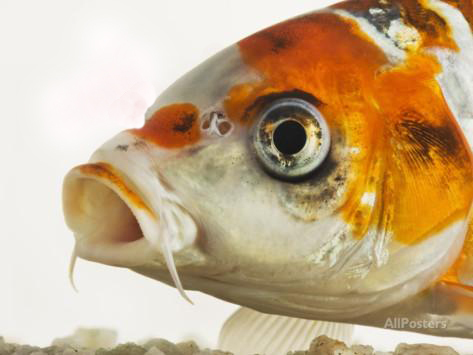 Stressed fish for whatever the reason can be very susceptible to these types of infections. When this happens the kidney does not function properly, and thus the Osmoregulatory function also, malfunctions. Then the fish swell with fluids and the eyes bulge as well. If this is the case, then the treatment regimen would be identical to the ones listed above; however, these cases can be a little tougher to cure and generally have a lower success rate. If we cannot identify exactly what started this chain of events or identify the stress factors, then we are less likely to be able to cure the fish. Sometimes fish can simply get bacterial infections for unknown reasons. These types of cases generally have a lower success rate in curing. In the ulcer situation we can usually trace it back to an original problem like parasites and/or water quality. This is the fourth and final way for a fish to get Dropsy, and probably the one that is the easiest to cure. Simply put, Koi are like people in that some are tougher than others. Some can be more resistant to disease for many reasons, like genetics and their environment, to name a few. As you know, Koi can tolerate the cold, but some do this better than others just as with people. When any fish gets overcome by extreme cold, however, and or gets hypothermia, this stress can cause kidney failure to begin. Once the kidney begins to malfunction, the Dropsy begins. This is what I call “Cold Water Dropsy”. Many times when a fish lies on its side in the cold water, this is the first sign of hypothermia. They will most likely not make it through the cold for any extended periods. This many times will start the process of kidney failure, and as discussed previously, this will manifest into Dropsy. In these cases of Dropsy, you would simply remove the fish from the cold water, and put it in a suitable tank where it can be slowly warmed. I would as well eventually get it to a temperature of 82 degreed F, but make sure not to raise the temperature more than five degrees in a 24 hour period. You must acclimate them slowly. Again I would utilize the higher salt level of .6% in the system. In many cases the warming of the fish in itself will set them well on their way to healing. The warmer temperatures make their immune systems kick into gear, and thus the kidney will generally come back to full operation. In these cases of Dropsy you can usually expect a large percentage of success in healing the fish. However, most likely you will not be able to return the fish to the cold water and will be forced to keep it indoors for the rest of the season until the weather outside warms. While pineconing, shown above, resembles dropsy, it is not the same. As previously mentioned, dropsy in an internal infection usually associated with the kidneys. Pineconing is an external infection of the skin and scales of the fish. With dropsy the scales stand out due to the fishes body swelling to the degree it pushes the scale outward and gives this open pine cone affect. Think of a scale like a flat clam. Two shells attached at one pivot point. Well a fish scale is similar but they are flat and hollow in the center. When the fish gets a skin infection this infection spreads into the pocket of the "clam shells". The scale then swells with fluid. You can easily differentiate a skin infection from dropsy by simply squeezing the scale. If it is a skin infection that scale will pop and eject the fluid within. Just like a pimple on a human. With dropsy there is no infection or fluid with the scale. For this disease I would use antibiotics and/or rub the entire body of the fish down with an antibiotic ointment like Neosporin. I would salt the system to .3% as discussed in many other symptoms treatments. Housing the fish in water 75 DF to 80 DF would also help tremendously as this is the temp range the immune system of the fish works best. I am not a big believer in antibiotic feed, but it won't hurt to try I suppose. The key is finding the antibiotic that will work for this particular bacterium. Even many professionals do not know the difference between this and dropsy and it often goes misdiagnosed. As a matter of fact, the fish in the above photo was misdiagnosed by a very famous breeder in Japan, and he was going to destroy the fish. He was convinced the fish had cancer ???? I don't know how he came to that conclusion, but once I explained what the problem truly was he began proper treatment. This fish actually belonged to a hobbyist in the USA. It is common for folks to buy fish in Japan and leave them there to grow further. Once finished they can then be entered in the all Japan Koi show. Then after that the fish is usually shipped to the buyer in the USA or wherever. Thanks to the proper diagnosis this fish is still alive today! There are many predators that can get your fish if they are not protected properly. This includes the smallest of fish to even the largest of fish. Some on the list include many of the wading birds like Herons and Egrets which are some of the most problematic of the birds. Other predators include owls, hawks, raccoons, domestic dogs and cats, otters, and mink. These are just some of the most common, but there are many more depending on what part of the country you are from. Of all the possible predators out there, the two most common which are spread all over the US are the Great Blue Heron and the sly mink. Many folks don't realize just how common wild mink are in many states. 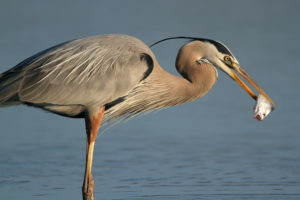 The Great Blue Heron is found throughout the USA. If you have a pond you can expect to be visited by one of these birds at some point in time. It's almost a sure thing and more a matter of when and not if! It doesn't matter where you live either! You could live in town, suburbs, housing developments, etc. These birds will most likely visit you at some point. Many people don't even see them and simply notice fish are missing! This is because quite often these birds come at first light in the morning and at dusk, with morning being the most common. So if you discover fish missing set your alarm to get up at dawn and look for them. In our online store we sell predator control items that work very well to deter these birds. In the photo above you can see the tell-tale sign of damage caused by the Great Blue Heron. As you can see there is severe damage on the body of these fish right behind the head. This is where these birds grab the fish most often. When they do this the fish struggle and the sharp beaks of these birds easily remove many of the scales in this area. Those horrible looking areas just behind the heads is where all the scales have been scraped off. These two fish happened to get loose from the grasp of the bird because they were so large. However, without proper attention and first aid they will surely die from these wounds. There are other signs that you may be or have recently been visited by one of these birds. Other than the obvious of missing fish, you may notice one day that your fish are acting skittish and afraid of you when previously they were friendly and came to you. This is a sure sign that something has been harassing them, so look for the evidence or the critter. When these birds defecate they leave behind a very liquid, runny, white mess! If they do this in the pond you will see what looks like a white oil slick over the entire surface. So make sure you rise early the next few days and look for them! Also check at dusk as well. Key times to keep an eye out for Heron is Spring and Fall. This is when many heron migrate to and from their home territories. So as they make their migrations they easily see our ponds and stop in for a quick bite! Not all heron migrate depending on the weather in your part of the country, but when they do their are lots of them in the air flying long distances. So even if there are not usually Heron in your area during this migration is when they will find your pond during the trip. Oh and if you want to be sure to attract Herons to your pond put out one of those Heron decoys they sell! Sarcasm people...don't waste your money on those as they will help attract these birds to your pond! Again a case of a manufacturer twisting a little science about these birds being solitary and not like being around others. While this is true normally it is not true if there is free and easy food like in our ponds! These birds will stand shoulder to shoulder if there is easy food around! As for the damage to the fish you should topically treat the wounds with Neosporin only and repeat as needed every few days until you see signs of healing. It would also help to salt the system to .3% (point three percent) for a period of weeks. 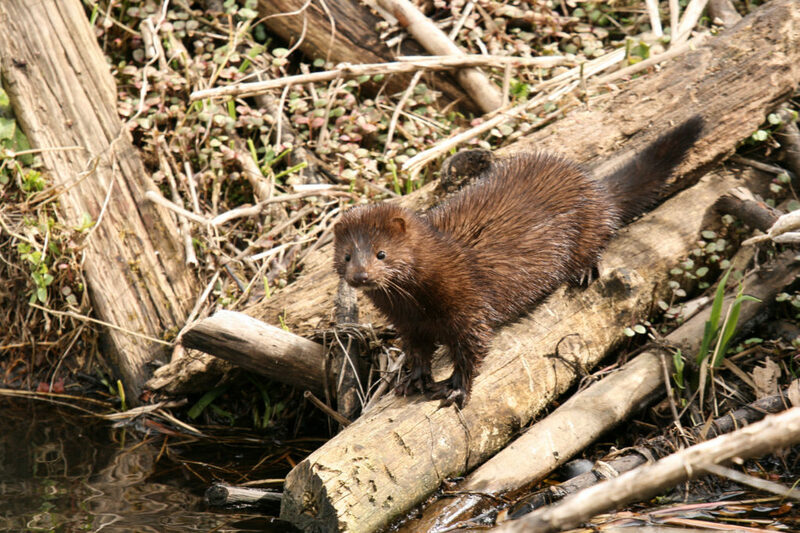 As stated, mink are more common and widespread than most people realize. The females are about the size of a ferret, and the males are a little larger. They are dark brown and usually have a white patch under their chins. They are very nocturnal and most people never see them even though they are all around. Other than an otter, which are not near as widespread, a mink is the only mammal that can swim down a healthy fish under water and catch it. It's not too often you will find any fish injured by a mink that need first aid. This is because it is seldom that fish get away from the mink once it gets a hold on one. Usually the only evidence is maybe a few scales on the ground pond-side, and maybe the tail of the fish. They normally eat the whole fish and in many cases carry the fish away from the pond to nearby woods and such and eat their catch there. Occasionally when they have eaten near their fill they will only eat the heads and leave the headless body laying around. If this is the case most times they do this pond-side so you will see the evidence. Most often mink visit our ponds in mid winter when their natural food is more scarce. Also at this time it can be a family group like a female and her nearly grown offspring. So you can imagine the damage this clan can do quickly. Many folks don't even look at their ponds much in winter and by the time you do the mink may have wiped you out completely! So if you have disappearing fish in mid winter and you haven't seen a Heron, it is a good bet it's a mink! If you suspect mink then you should contact a local trapper in your area. They can be difficult to catch near your ornamental ponds and watergardens. At the time of this writing in winter 2017 I just recently did battle with two here at the farm! Took me a week to catch the little buggers and I am an experienced trapper! Mouth rot is usually caused by a bacteria called Columnaris. This bacteria is common in crowded, dirty systems, and especially in gravel or rock bottom ponds. Many times it can start with the littlest of abrasion to the area of the mouth caused by rough surfaces in the pond. Like when fish feed on rock bottoms. The roughness of the rocks combined with the fact that the muck in those rocks stores tons of bad bacteria is a recipe for lots of Columnaris as well as Aeromonas problems that cause ulcers in Koi. You can try topical treatments of iodine once with a Q-Tip , but be careful not to get the iodine in the mouth or on the gill filaments or anywhere else on the fish. If that does not help try applying Neosporin as often as once daily as needed until the redness subsides. Tricide Neo also works for this but instead of following the label direction you could simply apply the powder with a Q-Tip directly to the infected area. It is always tough to try and diagnose from little info and/or a couple of photos. For this reason I am going to talk about a few things that could all be possible causes. I am also always so limited on time to write here that I am going to talk about some general diagnosing issues to cover lots of bases and similar cases of health issues. When I see people that have sick fish post their water parameters, two questions come to mind. I always start my interrogations with these two questions related to testing. NEVER TAKE THE TESTING RESULTS PEOPLE ARE GIVING YOU FOR GRANTED JUST BECAUSE THEY SAY THE WATER IS GOOD. The first thing you must do is prove beyond a shadow of a doubt that it is good, and HAS been good. The first question is have you been testing the water on a regular basis leading up to this problem. Quite often people do not test frequently enough, and then they have a problem and test the water and it seems fine......right then anyway. Well, that is fine and good, but it is VERY important to know how the water HAS BEEN for the last couple weeks to a month PRIOR to the health issues. Many times when water parameters get out of whack it stresses the fish and starts a chain of reactions that can lead up to health issues like bacteria and parasites. It is common for water quality issues to take about two weeks (on average and depending on the exact water issue) to manifest itself into another health issue. The stress of the poor water quality then causes the parasites to start invading and/or the bacteria to do the same. Whereas at the time the health issues show themselves, the water may have corrected itself, but the health issues have just begun two weeks or so after the fact of when the fish were stressed from poor water quality. This is why it is critical to test on a regular basis. This way you can say for sure that the water is, and HAS BEEN good for quite some time. Knowing this can really help in diagnosing and correcting health problems. Another issue and somewhat related to the first, is the type of test kits being used. Are the kits of high quality and up to date? It is my opinion that some of the best mid-line tests kits available for a reasonable price are Aquarium Pharmaceuticals liquid type reagent kits. There are other good test, and some better, but this brand is the most widely available, reliable, and plenty accurate enough. For more info on proper water testing, see Water Testing 101, and to learn what the results mean and how to fix poor water quality, see The Science of Water article. I mention both the regular testing and the test types because as mentioned above it is critical to know that the water testing is accurate for obvious reasons, and that it HAS been for sometime prior to issues of health. I have had many folks tell me their water was fine, only to find out later that the tests were inaccurate, or that they do not regularly test their water. It is very important sometimes to know if the water is not only good now for sure, but that it HAS been good for some time and on a regular basis. There are other times when the symptoms they describe seem like they are water quality related; yet they tell me the water is fine. Water quality is always a prime suspect if most of the fish exhibit symptoms of some sort, and these symptoms appeared quickly over a day or two period. This is why I always tell folks to have two different sets of the same brand kits. In this way, if you doubt the tests, you can help to verify it by testing with the other set. I can't tell you how many times we have found issues this way and that the first tests were incorrect. This is speaking for ALL brands as well. Get a second set to verify water quality in times of health issues. Let's face it, we are not going to be able to fix the fish unless we know FOR SURE that the water is good. Parasitic and other pathogen issues excluding viral, usually manifest slowly over time in a fish or two at a time. Now let's talk about sudden deaths. While there are cases of sudden deaths for no apparent reason, this is not common. These cases that are truly "sudden death" can be caused by injury, poison, heart attacks, shock etc. It can happen, but as stated is not the norm. In most cases people are missing previous symptoms. Excluding true sudden death cases, the fish will ALWAYS exhibit symptoms anywhere from a few days to a week in advance of death. Learn to read their body language. Of course, this is also depends on how often you see your fish. If you see them on a daily basis, you should be able to see the changes and symptoms quite easily if you know what to look for. It is for this reason that you can't always take for granted that there were no previous symptoms just because they said there were not. Do they not know enough that they may have missed them? You have to figure this out when diagnosing so ask the obvious questions to find out. Beyond obvious symptoms like ulcers (sores) and such, the gills are probably THE most important place to look for clues when diagnosing health issues, and especially when forced to diagnose without the use of a microscope. 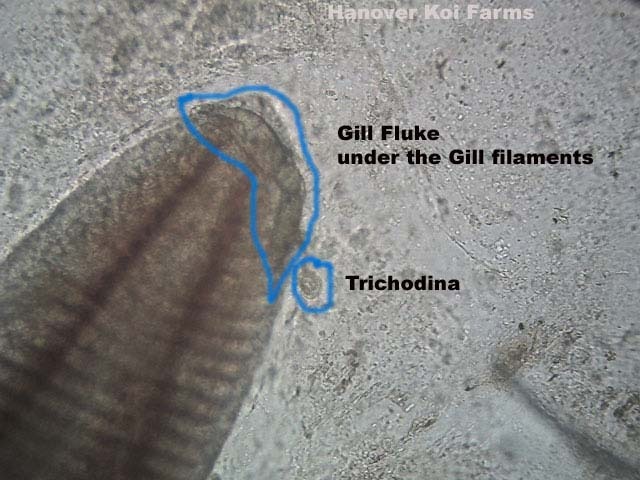 Even with a scope the gills are the most important place to look, be it for parasites, virus symptoms, and bacterial issues. Too many folks are intimidated and do not inspect or scope the gills thorough enough. Even those that do scope the gills do gill "scrapes" as opposed to gill "snips" because they are afraid of hurting the fish. I will say this: " Gill "scrapes" are far inferior to gill "snips" and many things can be missed in a scrape. Learn to do gill "snips". This is just another reason you can't take for granted when folks say they scoped the gills. Did they scrape or snip? It really matters a lot. Many times I don't see pictures of the gills or hear folks talk about what the gills look like. Even those that do show photos of the gills quite often do not see the problems that are there and say they look fine. You need to learn what good gills look like. This is why you should do regular inspections of healthy fish and learn what healthy gills look like. Some gill issues are subtler than others. Gills can have excess mucus in them for example, and this is commonly missed by a lot of people. Necrosis, (white patches or eaten away filaments) are obvious, but that is not the only symptom of gill issues. It is too difficult to describe what a healthy gill should look like, so learn from your healthy fish now. A few things can cause this. 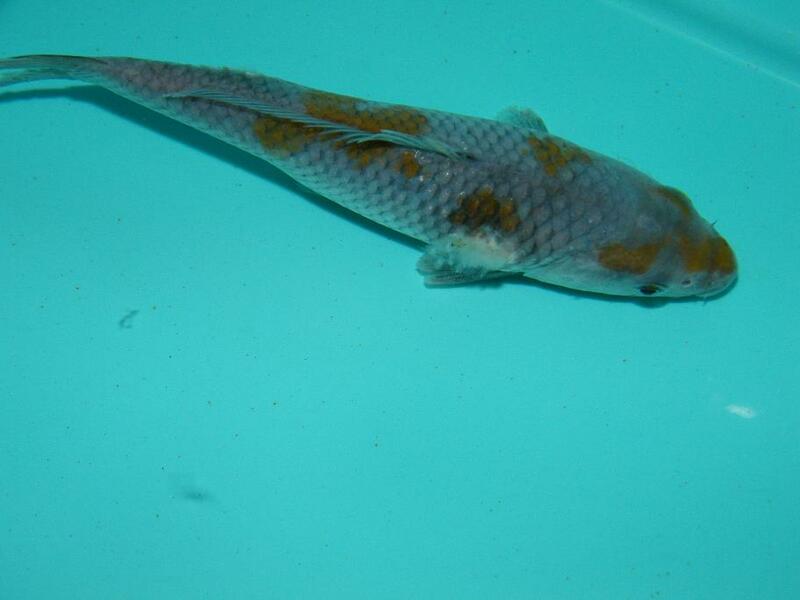 Sometimes there are simply Koi that have this from birth, and it is a deformity. You should know this by inspecting your fish closely when you get them. If you first notice it only when they are sick, but they had it all along, it will lead you astray in diagnosing problems. A Koi with a notch is not always a sick Koi. They can be born this way sometimes or a physical injury can cause the notch as well. This will sound silly to some of you, but Koi can "break their nose" so to speak and cause this similar notch. This is common on a farm where we bring fish in from the mud ponds and put them into tanks. These fish can be quite wild at times and will swim rapidly around the tank and bounce off of the sides of the tanks nose first. This can cause the physical damage to the nose area and thus cause the notch as well. It can also cause bruising around the mouth as well. I have seen fish in a fright mode that have actually hit the side of the tank so hard that it knocked them senseless, and at times even killed them. So, as you can see, this is a possibility in this case of the bruised mouth and notched nose. This notch can also be caused by dehydration. Yes, fish can get dehydrated believe it or not. This, however, is usually a result of some health issue. Now, both of these symptoms are also known symptoms of Columnaris infection as well, and the purple lips can also be a symptom of Aeromonas bacteria as well. Especially Aeromonas Salmonicida. So knowing the Koi history and what they looked like prior to the current health issue is again important as you can see. This is why you should do regular, thorough inspections of your fish, but especially new fish. You need to be sure that if you see a notch that it was there before or not. Speaking of Aeromonas Salmonicida, I had a battle in the winter of 2007 with this strain. All the fish started with this purple mouth look, but mine were more on the lips but some were as shown in this thread. They later developed the standard ulcers. It was a tough battle and nothing seemed to work until it was finally able to be cultured and a sensitivity test was done. The sensitivity test revealed that Oxolinic Acid would kill them, and it did. sores. Many other strains can move into the ulcer area after the Salmonicida makes the ulcer, but they are secondary invaders. I threw this fact in here and in other articles because this is little known throughout the industry. It is important because it is still a possibility in this particular case with these particular fish. Another fact about this strain of Aeromonas is that it is very difficult to culture. This is relevant because in order to do a sensitivity test to determine what will kill this strain, you first need to grow a culture of it. This does not always happen, believe it or not. To date, no one knows why this strain is so difficult to culture, but I can tell you that in cases of ulcers in Koi, it is the primary culprit. However, you must also kill the other strains of Aeromonas or Pseudomonas that make attack the area as well and in addition to the Salmonicida. These strains may not have the same sensitivities to a particular treatment that the Salmonicida does or vice-versa. Another problem with this strain being difficult to culture is the fact that if you had a culture test done and only other strains showed up on the culture, you would treat those strains with the recommended antibacterial that may not kill the uncultured Salmonicida. In most cases, bacterial infections involving wounds will have multiple strains of bacteria, and it is important to utilize a treatment that will kill all of them, or multiple treatments with multiple antibiotics. See the problems here? Now, in all of this, we are still forced at times to diagnose without a scope and without a culture test. Let's look at the possibilities. Without the aid of a scope or bacterial culture or viral testing, you will most certainly be forced to "shotgun" treat for everything. This of course is not the ideal way of doing things, as it is much better to know exactly what we are trying to kill. However, it is possible to narrow things down to a category we think is most likely and start there with treatments. Water quality is a given and the easiest to correct, so I won't go into details. Physical injury is less frequent and usually more obvious as well, so I won't go into details there either. You simply have to use what I have discussed above and common sense and try to figure out if that is what you think happened. Protozoan parasites are easily treated, and I prefer. Salt, PP, Quick Cure, and ProForm C depending on what I am seeing. The overall health of the fish, and slime coat integrity, and in the cases of scoped fish, the degree of infestation, are all determining factors in which of the above meds I use. 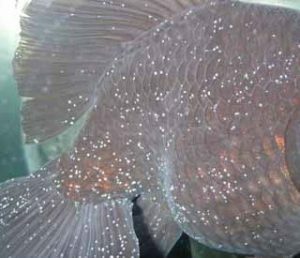 For example, sometimes fish with Costia have little to no slime coat. In these cases I would start with low salt ar .1% to help them build more slime. However, you must consider the degree of infestation as well, as to what you start with, and how fast, how strong, and how often you treat. In all this, if the infestation is high, you better kill the bugs quickly before they kill the fish. It gets tricky here because some meds like ProForm are too gentle to do a good job on the bugs in a timely enough manner before the bugs kill the fish. However if you use something like PP or Quick Cure on a fish with no slime, you may burn the fish with these stronger treatments. On the other hand, you may have a fish with excess slime, like in some Costia cases. In this cases you have to use something strong enough to penetrate the slime to get to the bugs. In these cases I would use PP at a dose I feel comfortable with, that is strong enough to strip some slime and get to the bugs. PP at 4PPM for six hours would be my choice. However, you should read other details of this method on my website, as it can be dangerous in inexperienced hands. Tremetodes like flukes, I primarily use fluke tabs and Prazi. I prefer to use fluke tabs, but as mentioned above there are times I need the more gentle Prazi due to slime integrity and overall condition of the fish. Crustaceans like anchor worms and fish lice I use Dimilin all the time. You will hear most folks say you will be able to see these bugs on fish, but that IS NOT TRUE IN ALL CASES. Both of these bugs have microscopic stages that cannot be see with the naked eye. As a matter of fact, these microscopic stages are responsible for more deaths than the visible stages. With bacterial issues, you must remember that these are usually secondary invader. It is therefore critical to find out what cause the initial problems be it parasites and/or water quality. They need to be addressed first before treating the bacteria in many cases. Columnaris bacteria can commonly be a primary bacterial infection, however, and does not always need another parasite to be involved. This is also the case with physical injuries like scratches and such that become infected with bacteria after the physical injury. Any time I have sores/ulcers or any breaks in the skin I use topical treatments like iodine, ointments and dips like Tricide in addition to bath type treatments. Again, without a culture, it is tough to get good results with broad-spectrum antibacterial treatments. I do like the results of Tricide Neo, and Oxolinic acid for general uncultured bacterial issues. I use shots infrequently as it is not practical in my situation. I may if it is a single fish or two or a valuable one. Most time I do dips and baths. It is more practical for the hobbyist to do shots IF they can get the injectable meds. Viral requires lab testing and that is the only thing that can be done to verify its presence. If they do have KHV or SVC they should be put down anyway, and not be treated. We will discuss these viral infections in another article. As you can see, I can't begin to guess the problem with the fish in this thread without more info. Even then it would be a guess without a scope. If the fish TRULY showed no other symptoms prior to death, the I would say physical injury or something along those lines. So, the main question is: were there other symptoms or not prior to death? Who knows? The best one to answer that question is the person whose fish are having the issues. Only he can judge his ability to have seen or not seen any other symptoms. My goal with all of this was to simply help folks better diagnose their own problems, and they are the most qualified once they learn how to do it. They are there in person with the fish, and no amount of pictures or writing can replace that.